Weather – Pleasant week for the most part. Low in the 60’s and highs in the high 70’s. Mostly sunny. Winds gave us a break earlier in the week but got stronger (and colder) as the week went on. 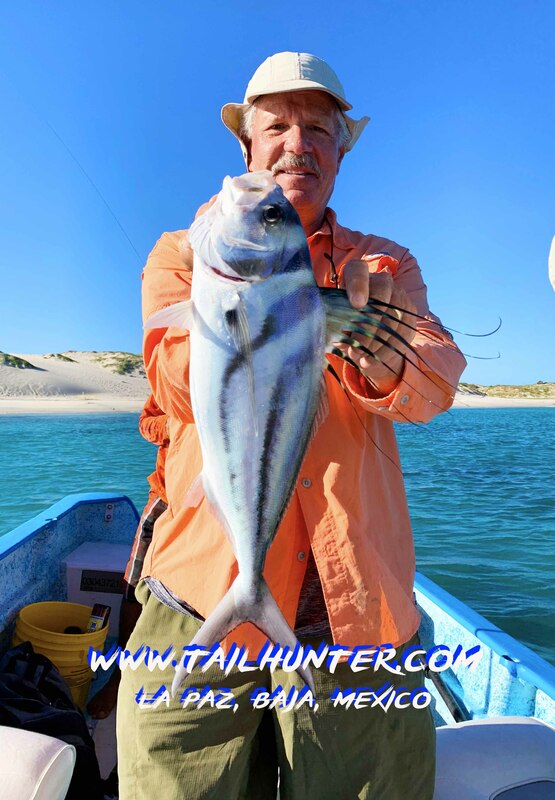 Fishing – More blue water species early in the week when the winds were down and it was calmer. More inshore and rock fish as weather got rougher and we had to fish closer in. 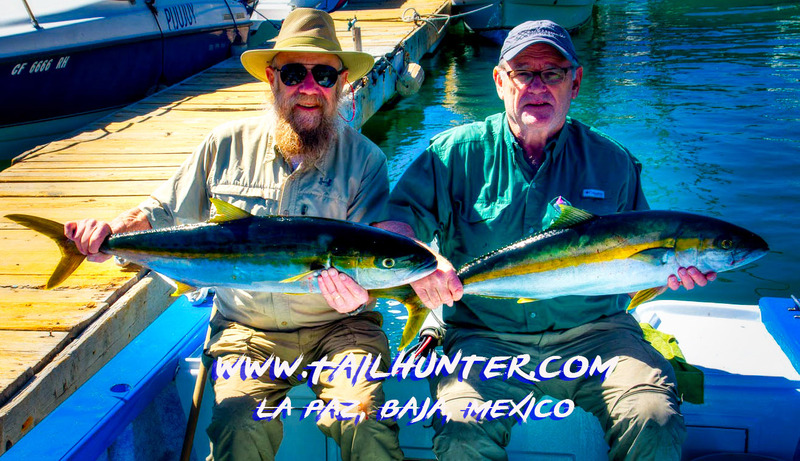 Gary Wagner, owner of Rancho Costa there at Muertos, hooked 4 dorado and got 2 to the boat. 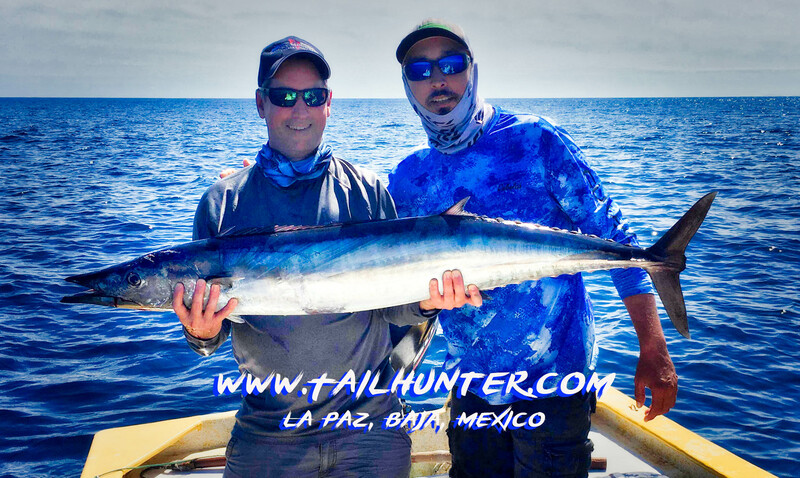 He had a wahoo come off and he had a tuna on for over an hour before it came unbuttoned. Looks cold! 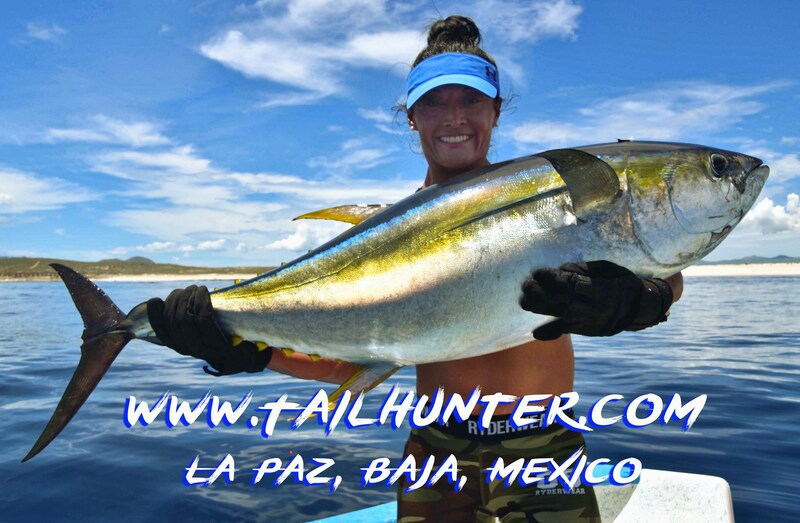 Laura Hernandez from San Diego got out a few days earlier in the week and got into the dorado. Later, as conditions changed, some huge sierra. Not too bad a week, for the weather. It was just cold (by our La Paz standards!). Tourists were still running around in shorts while locals donned long pants and jackets! Likewise, earlier in the week, winds laid down long enough to get boats out and fortunately for our type of fishing, no one really had to go out very far. 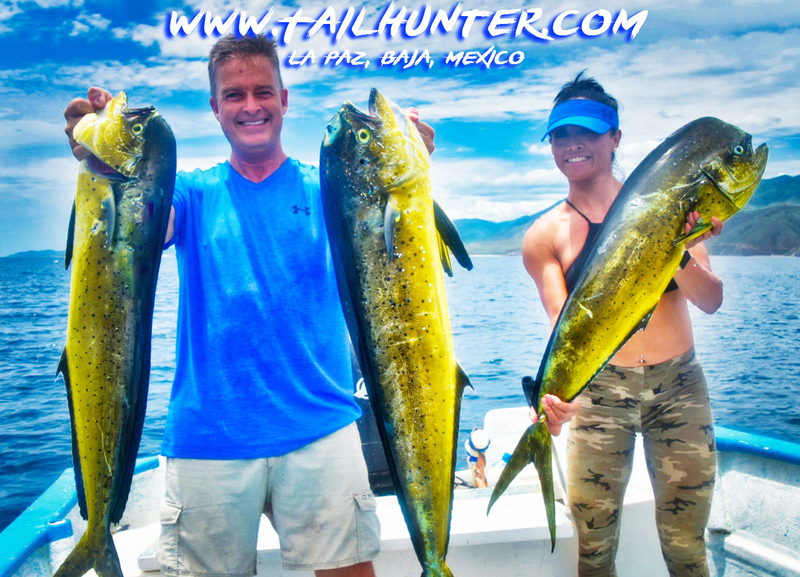 There’s still some schools of dorado around with some nicer 15-20 pounders mixed in. Very surprising given the time of year. 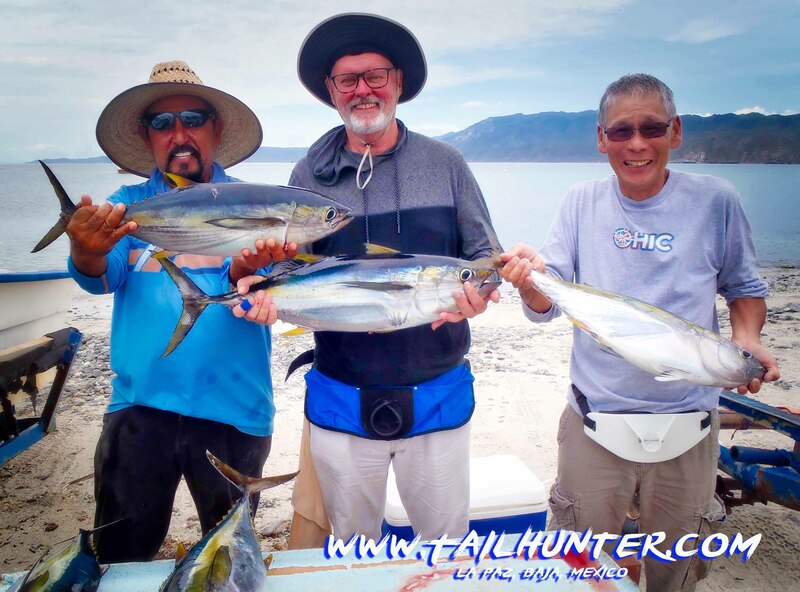 Along with the dorado, some tuna were also hooked and a wahoo did bite one of the lines but came unbuttoned which is an encouraging sign (that it bit, not that it came off!). 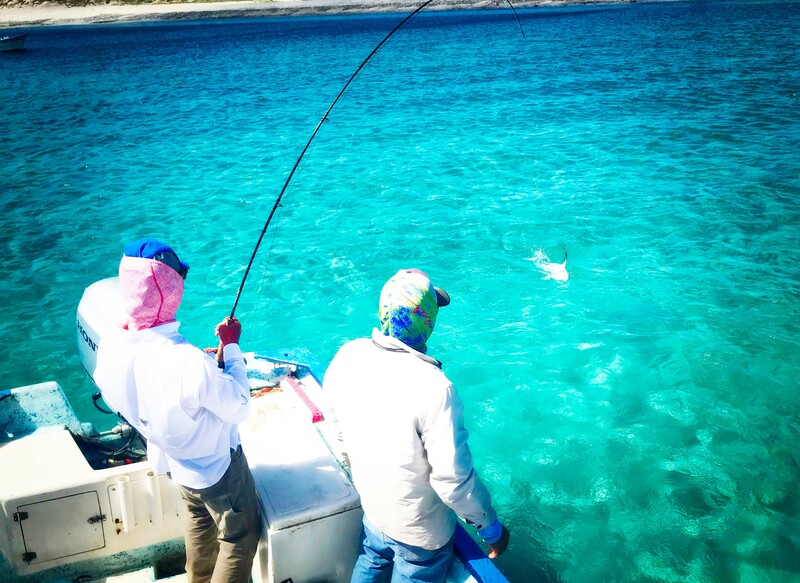 Plus, add in the usual bonito and way too many needlefish. All-in-all, not too bad. 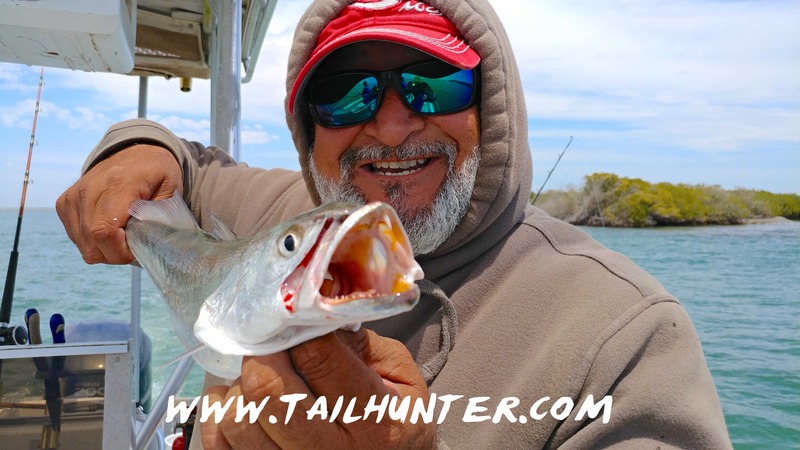 As the week went on, winds came up again and the waters changed resulting in more restricted fishing with colder-water species like sierra, jack crevalle, cabrilla and snapper biting. Hard to know when not that many folks are fishing. Most of the visitors to town are snowbirds just looking for sunshine and an escape from even colder places. Locals are all getting ready for Christmas. Our annual whale-watching season is almost upon us. 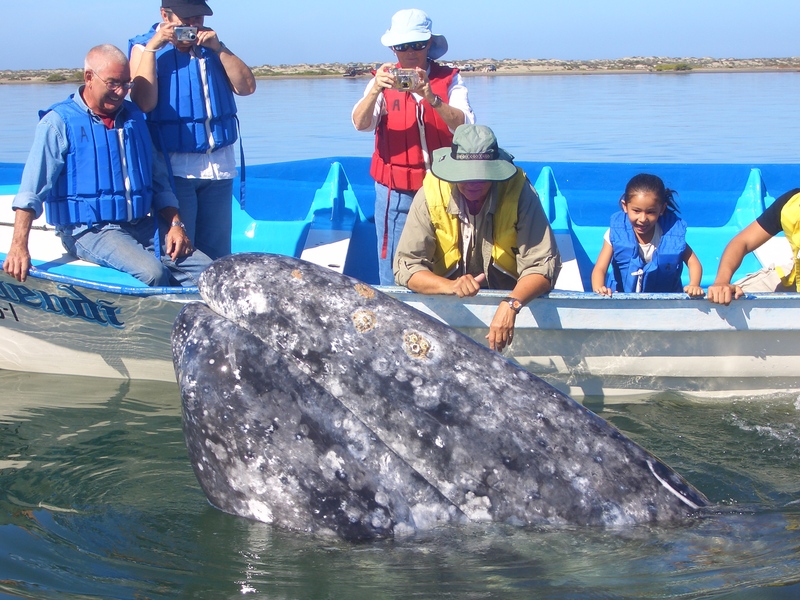 Migrating yearly from the Bering Sea by Alaska, the whales are on their way to Baja to mate, give birth and hang out in the warm lagoons of the Pacific. We have daily and overnight trips booking fast. 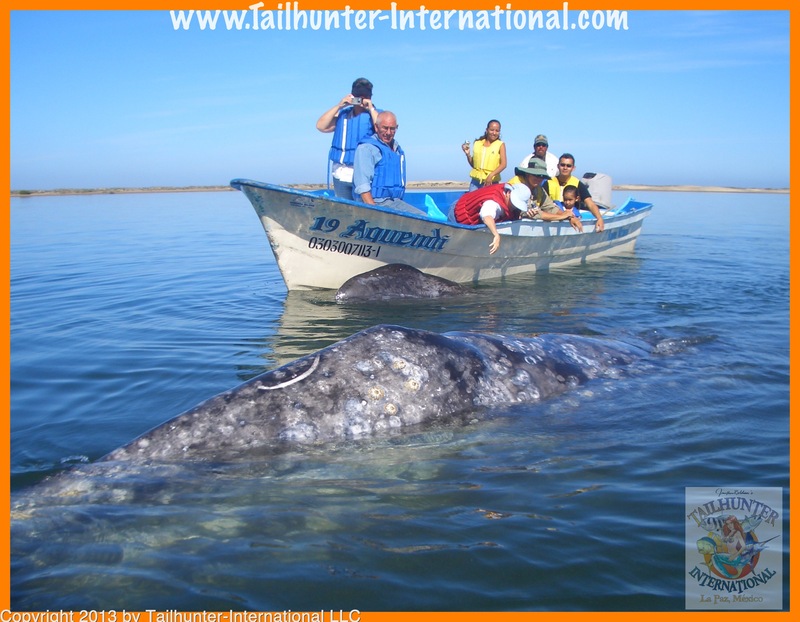 Contact us for more details for a great family trip! 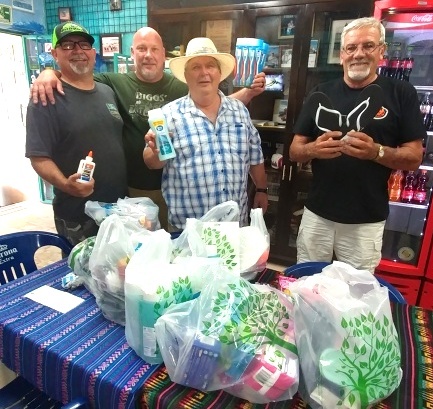 Many of you know that my wife, Jilly, has had a program for five years whereby Tailhunter Outreach program collects clothes, toys, sporting goods, school supplies, medical supplies and more for needy folks and communities in and around La Paz. 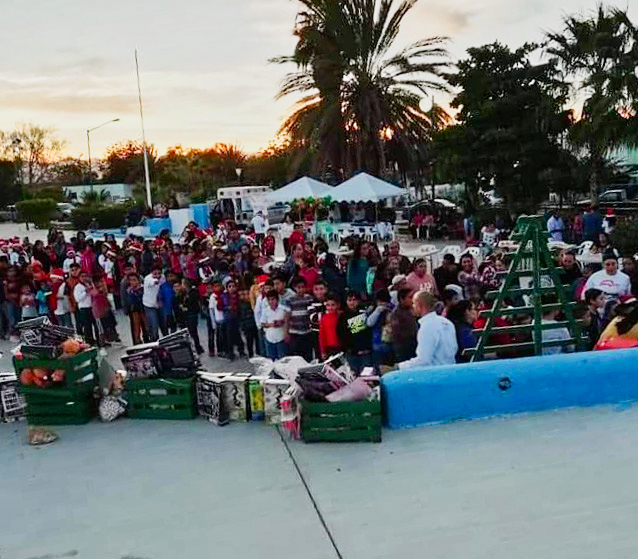 It was originally started after Hurricane Odile crashed into us in 2014, but the program just kept growing. 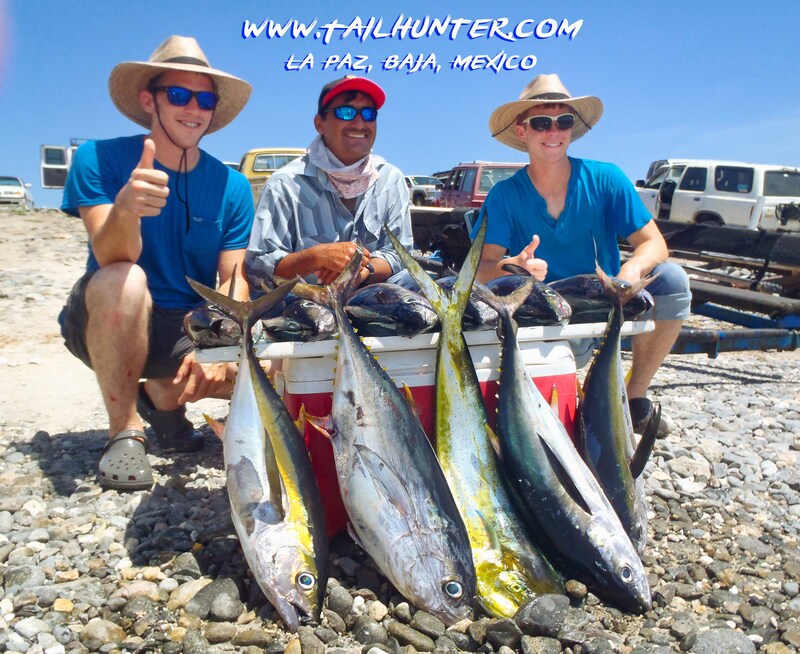 To date, our Tailhunter amigos and brought down over 3 tons of good that we distribute throughout the year! Jill also has a scholarship program to keep kids in school as well. Planes (near Muertos Bay where many of our captains and their families live). 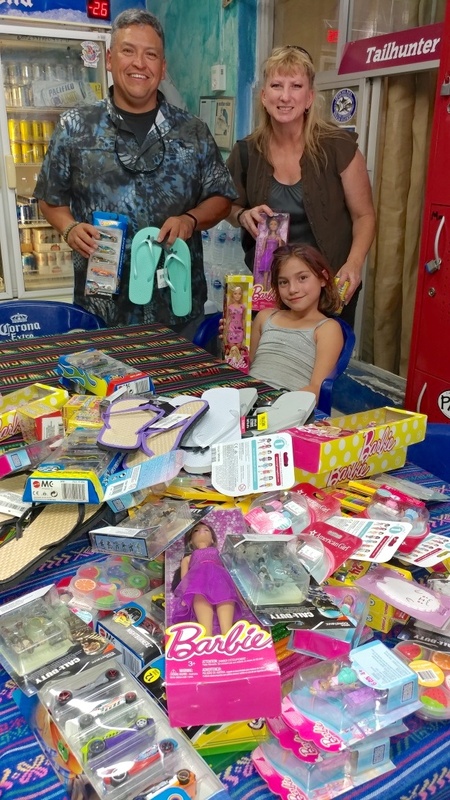 With the assistance of Gary Wagner and his crew at Rancho Costa, all these kids got something for Christmas! Thanks, Jorge and Sandra! Weather – No shortage of sunshine. It’s really pleasant to be in town right now . Daytime temps in the mid-80’s with a breeze. Nights in the low 70’s. 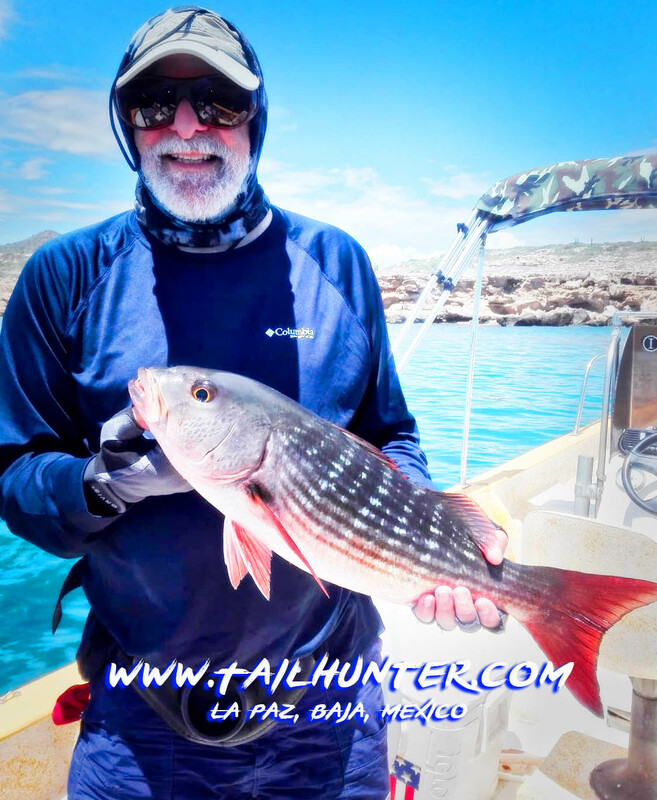 However, not always great to be on the water as Hurricane Willa (hundreds of miles to the south) didn’t mess with us, it did send up some huge swells and strong wind that caused us to shut down our Las Arenas/ Muertos Bay Fishing for 2 days. 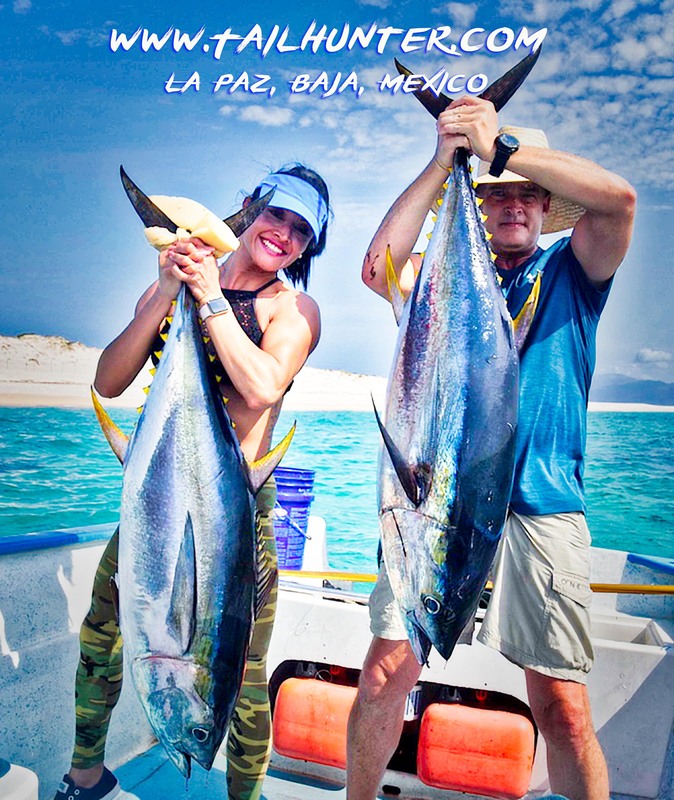 Then, increasing northern winds have made it difficult at time fishing out’ve La Paz. (Also makes it tough to find bait!). The seasons are changing. Water – The increasing winds are lowering the water temperatures and the water is getting more green although there’s still some great blue water around . It’s all in transition. 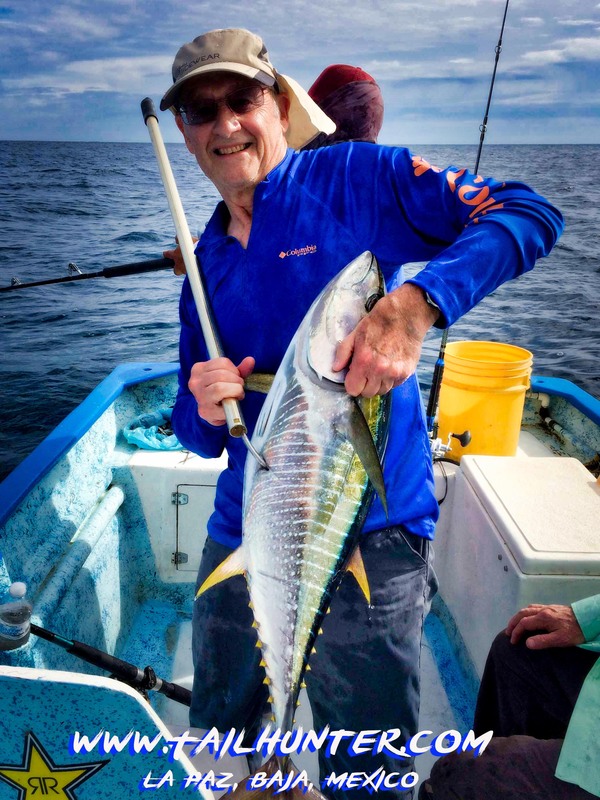 Fishing – Maybe it was a combination of variables. Erratic winds. A full moon. Big swells. All of it contributed to a tougher week of fishing. I’ve seen worse. But I have also seen better. We had to work hard to get fish sometimes. Moreso than normal. More cooler water species showing up. Fewer blue-water fish around. Also, the ability to find and catch bait is affected by the weather. Harder to catch bait means harder to catch fish. 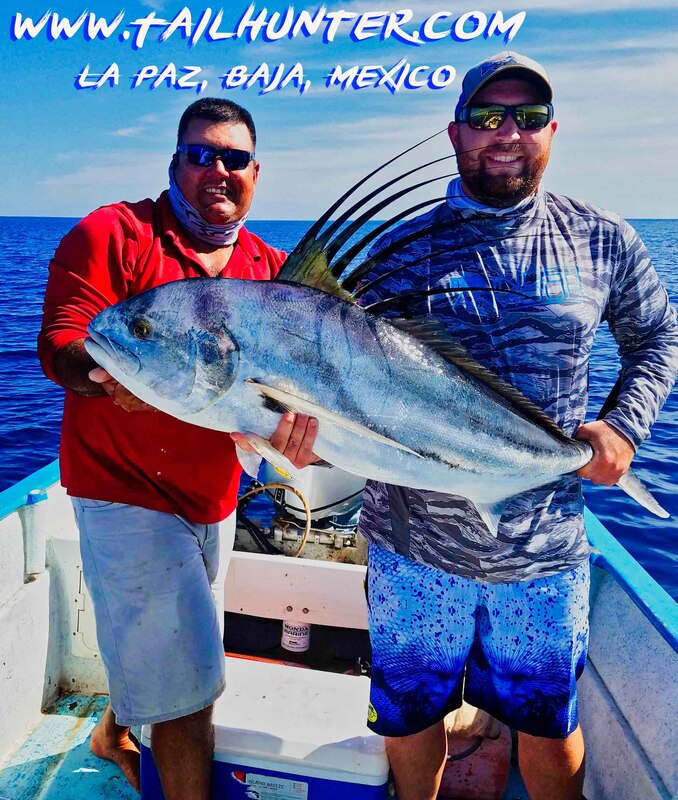 Caught This Week – tuna, wahoo, dorado, jack crevalle, lots of bonito, needlefish, roosterfish, pargo liso, cabrilla, triggerfish, dog-tooth snapper, pompano, palometa. Outlook for Coming Week – Probably alot more of the same. Off-season imminent. Our Montana friend, Darrel Zauner, hooked into a few of these beasts, but finally got a big dog-tooth to the boat! 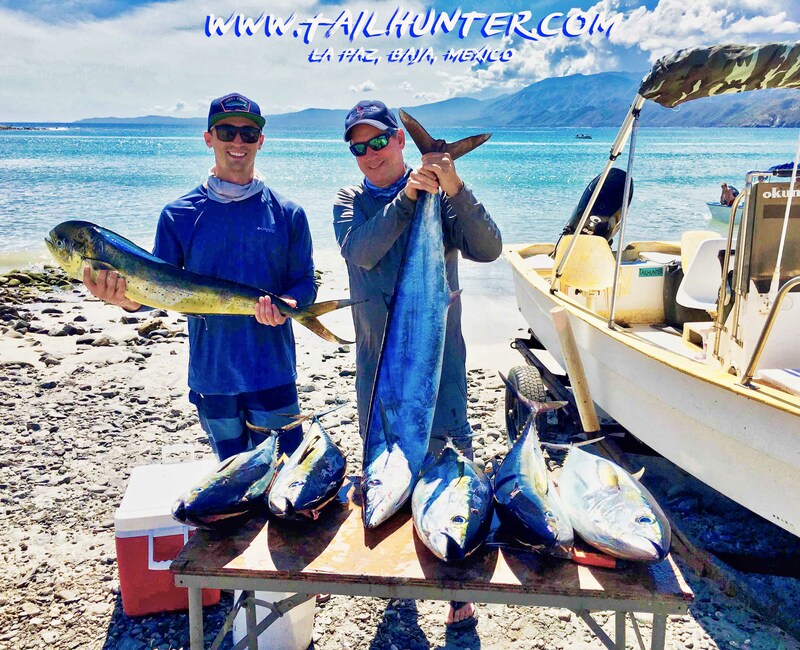 Gary Pilkington has been visiting us for years and it was good to see him finally get his first wahoo! 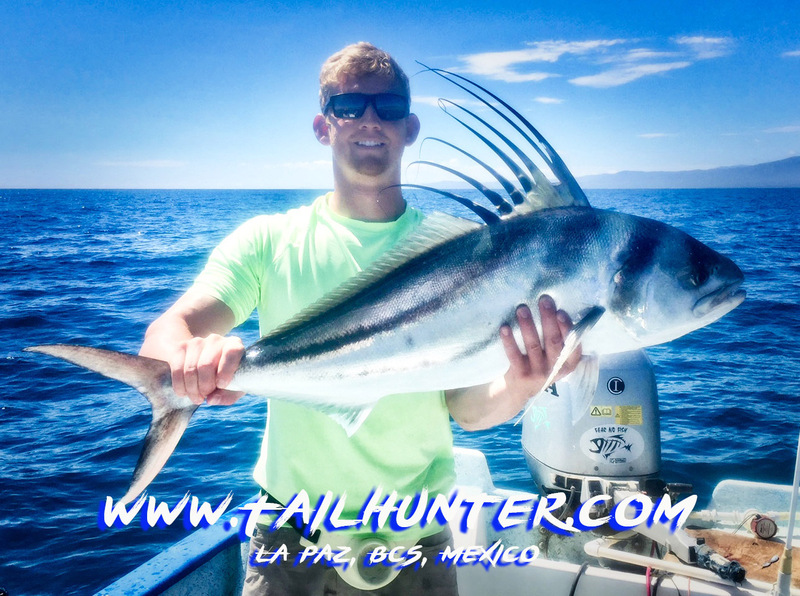 Lots of “firsts” this week like this good-looking roosterfish caught by Mike Hanson from Grants’ Pass, Oregon while fishing with Captain Gerardo. The fish is alot bigger than it looks. 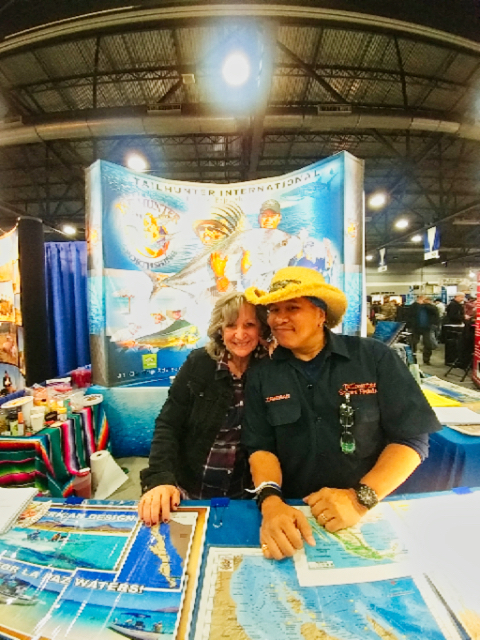 Both Mike and Captain Gerardo are abut 6’3″ tall! The fish was released. 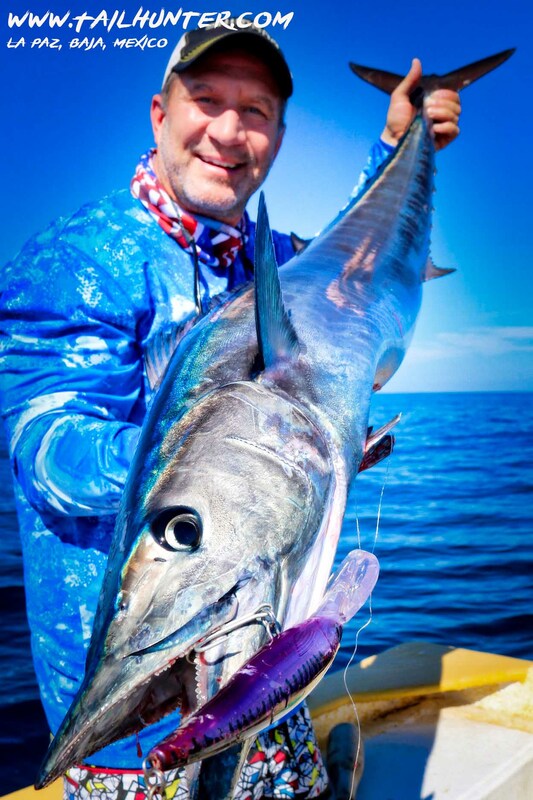 Outdoor writer, lecturer, author and TV show host, Scott Haugen finally came to visit us from his home in Oregon and put the hurt on this sizeable wahoo using a purple Rapala. Some good eats here! 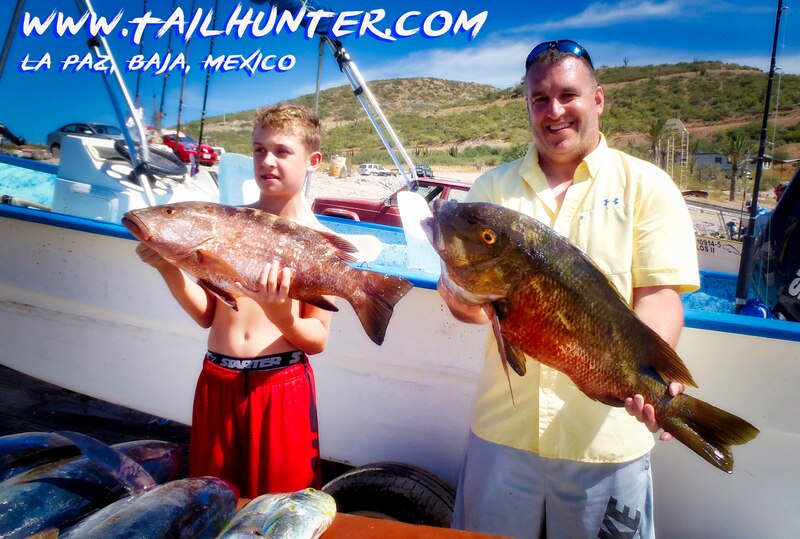 Two different kinds of pargo caught by Tanner Millspaugh and his dad, Travis, from Washington state. 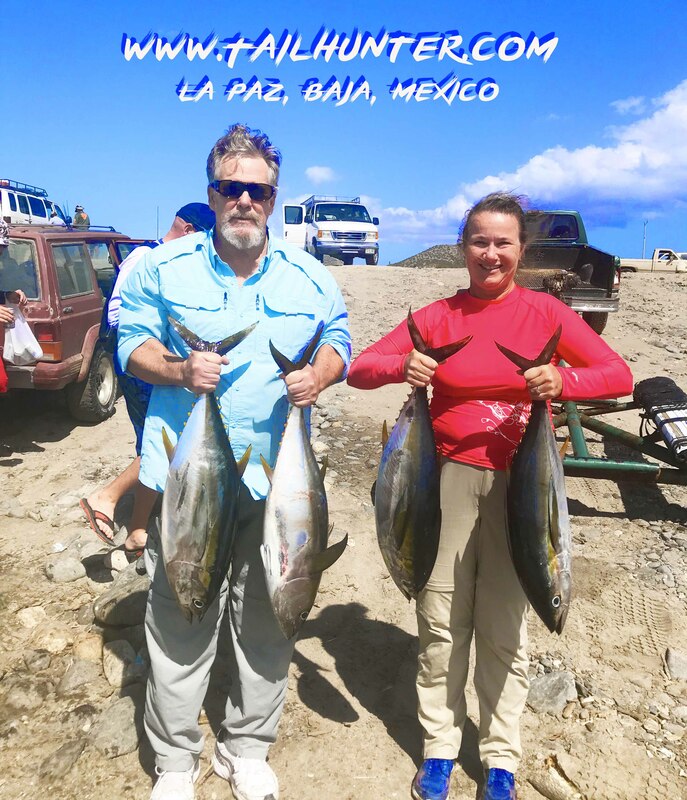 Two of our new favorite amigos, Debbie Arvin and Lynn Murphy from Colorado, with Captain Armando and some pretty yellowfin tuna. A solid day to sea-the-least! 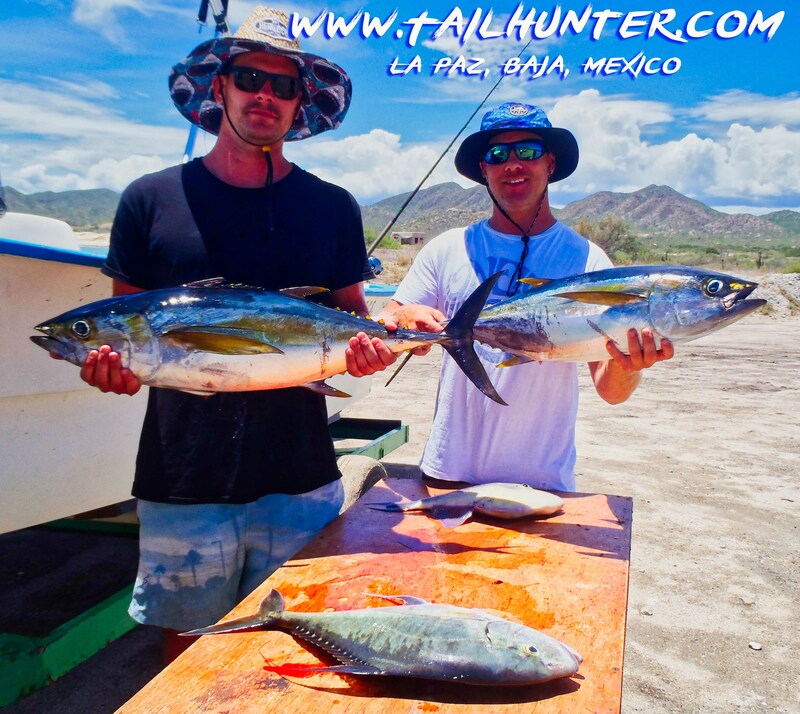 Mike and dad Gary Pilkington with a rack of tuna, a dorado plus a wahoo! Grand slam! 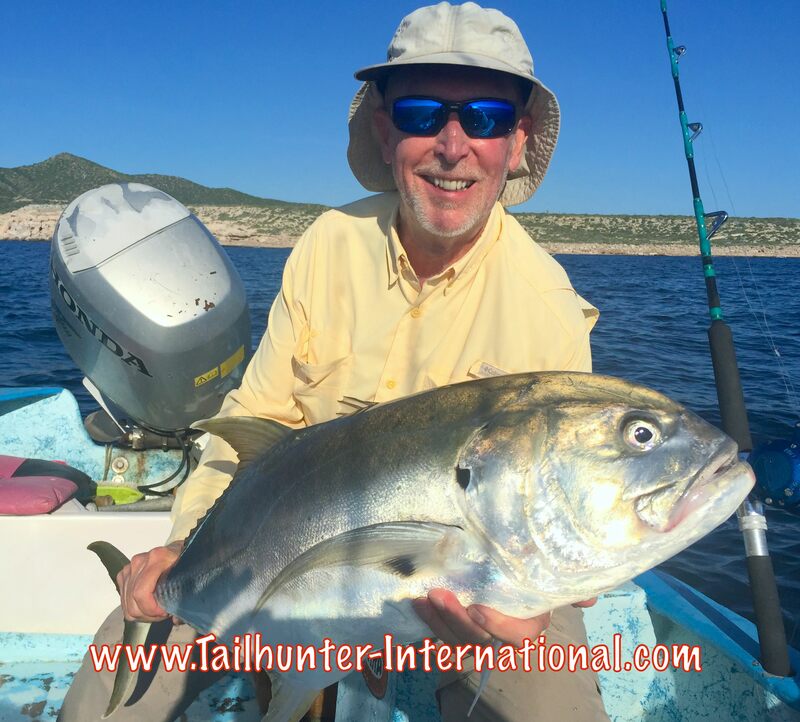 First-time visitor from Colorado, in rough water, Don Vanzo got a legit bull dorado on the gaff. That’s the right kind! 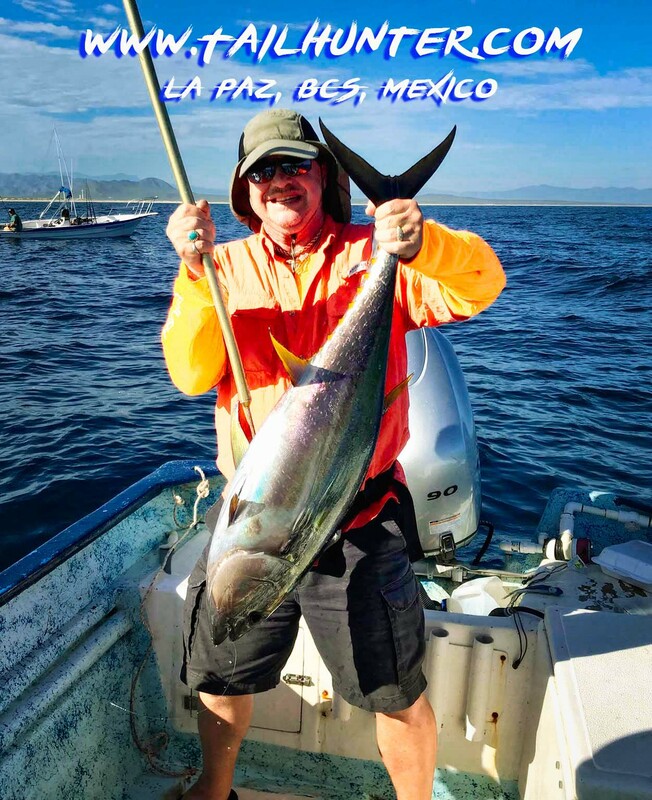 John Morgenstern all the way from South Dakota got another tuna into the panga and a great photo! HI Paula! Well done, amiga! 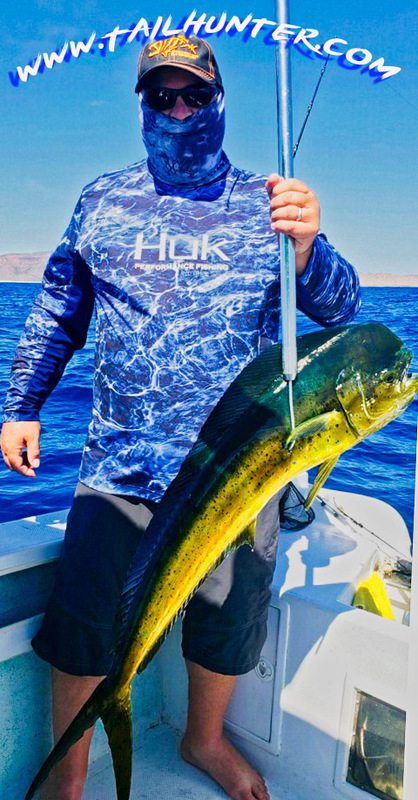 Nice bull dorado! Alaska in the house! 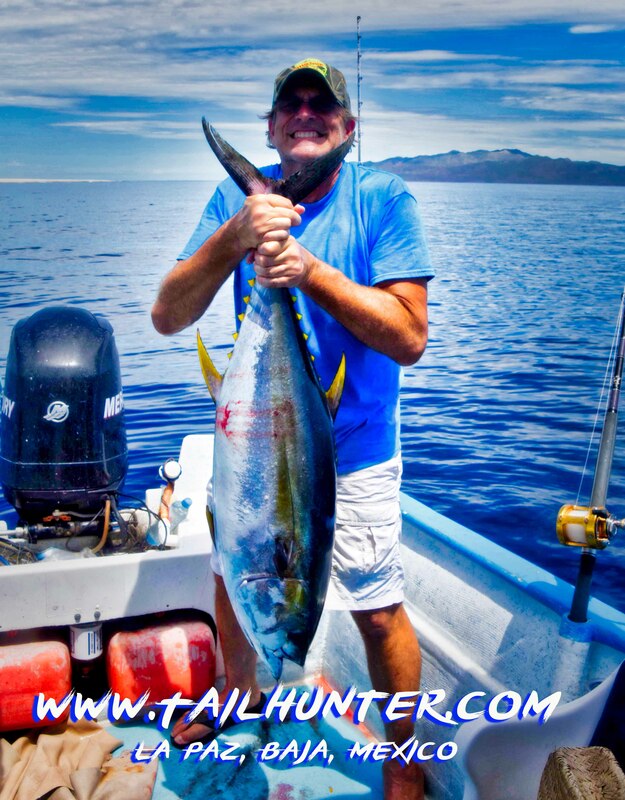 John Daley with Captain Moncho and alot of tuna meat headed to the freezers. Just too pretty of a photo. 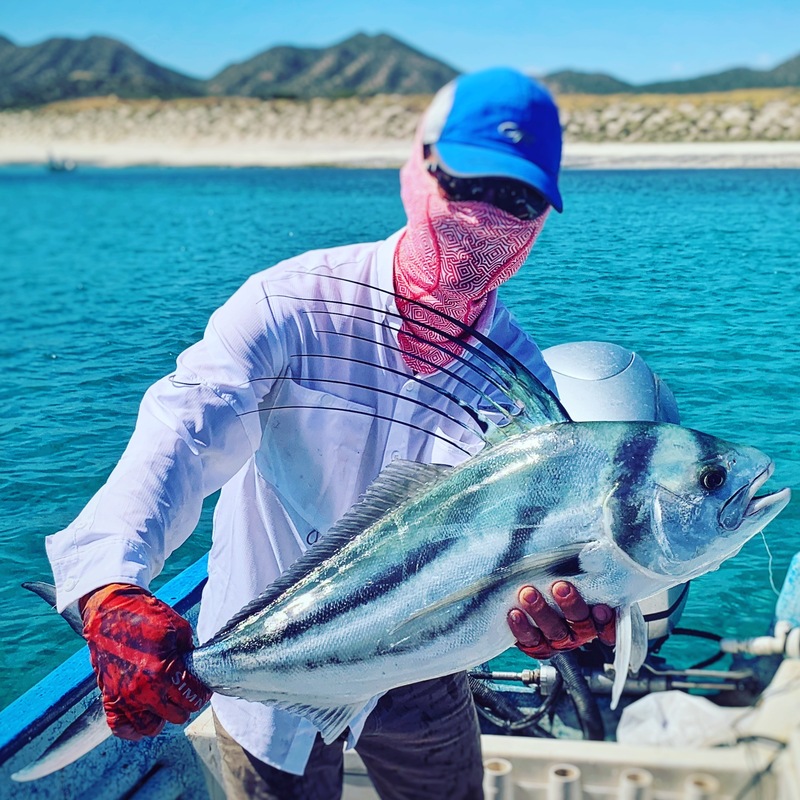 This is Jae Shin from Alaska with a roosterfish on the flyrod in Bahia Muertos. 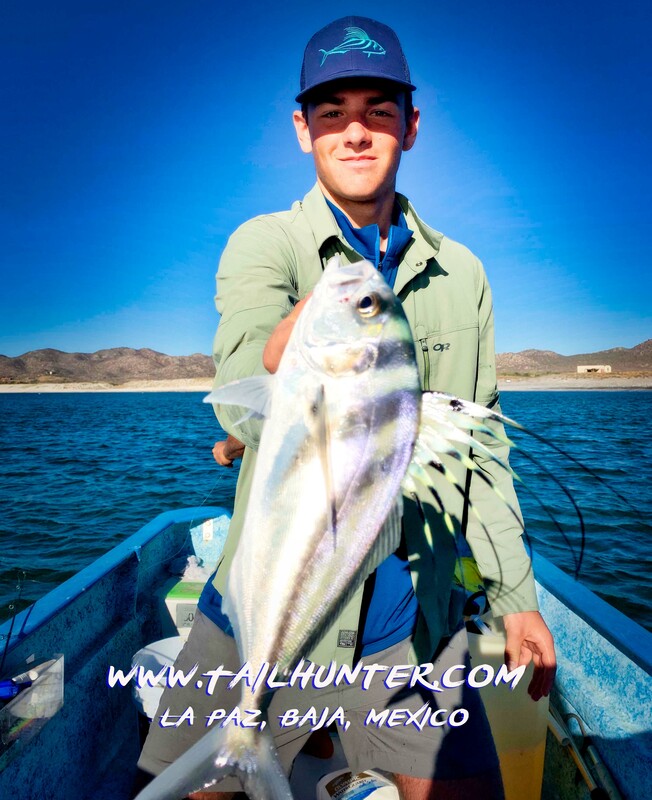 Here’s Jae’s roosterfish caught on the flyrod . Great fun on such light tackle! The rooster was released. That’s Bahia Muertos water. She’s an author and lecturer and teaches classes in outdoor cooking! 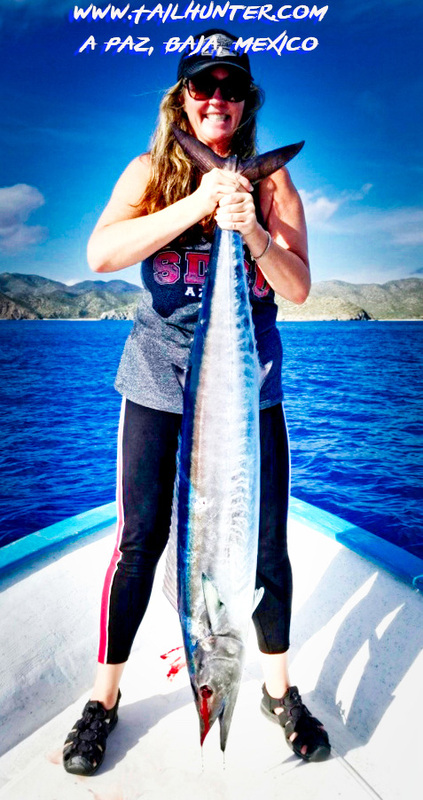 Tiffany Haugen poses great with a wahoo in the blue waters near Punta Arenas. 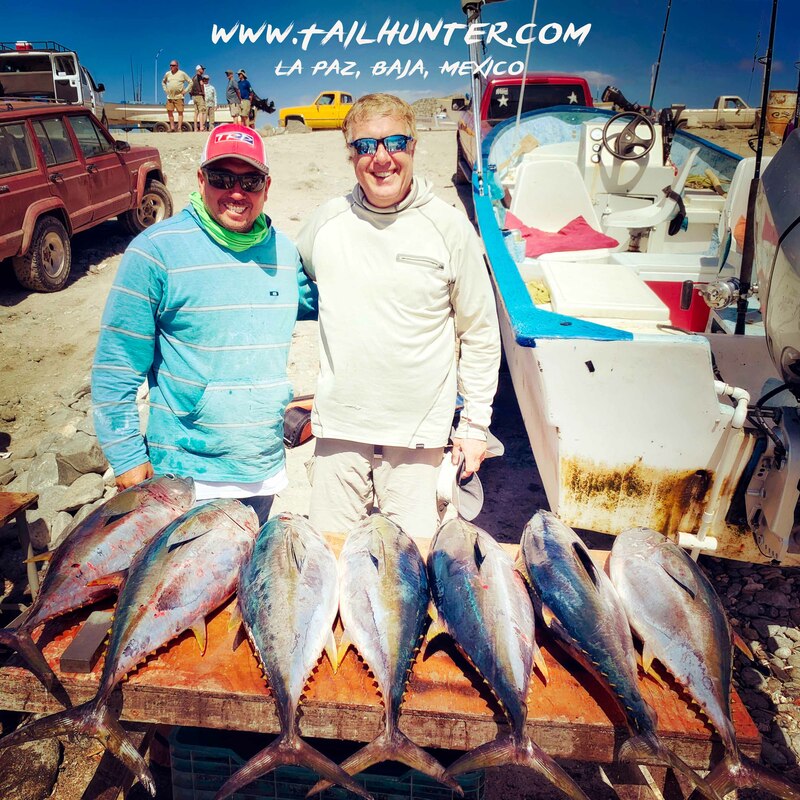 Robbie Boyd and his dad, Bill, and Captain Jorge display a pretty pargo liso an a couple of yellowfin tuna on the beach at Muertos Bay. 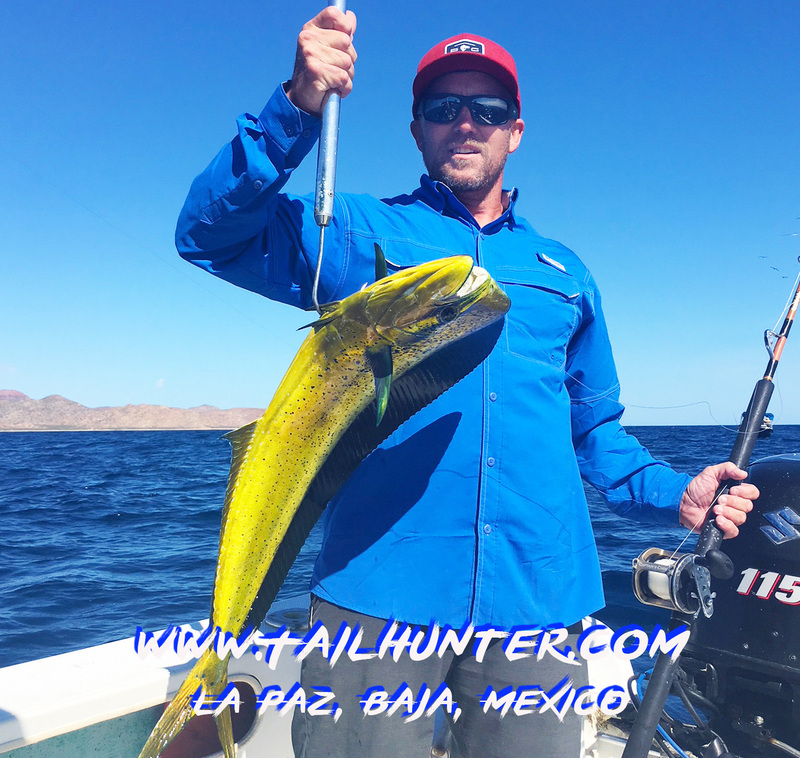 He looks grim, but Brian is actually a nice guy with two handfuls of dorado and tuna caught with our Tailhunter La Paz fleet. You’re kidding! Greg Garrison and Nic Huff sport THREE big wahoo from a day of fishing right off the rocks at Punta Arenas. 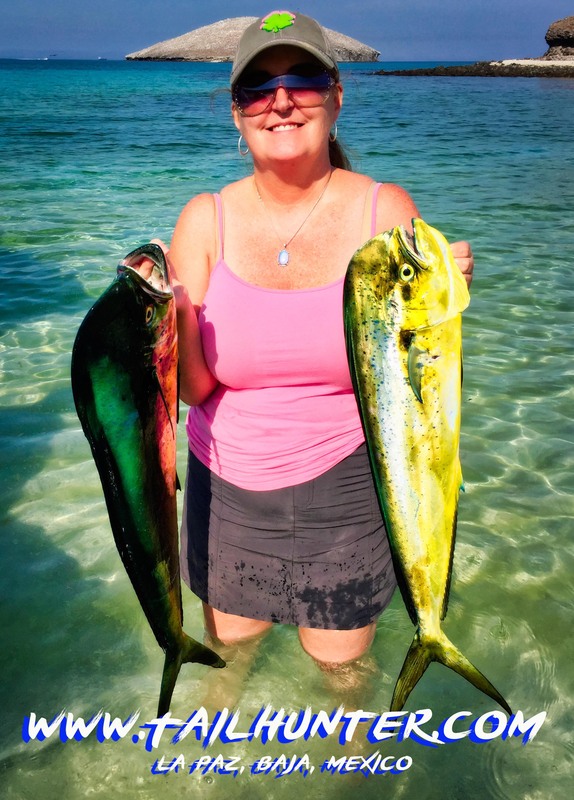 Celebrating Lollie Milano’s retirement, Dana Milano came down for the week and got themselves some nice yellowfin going on ice. 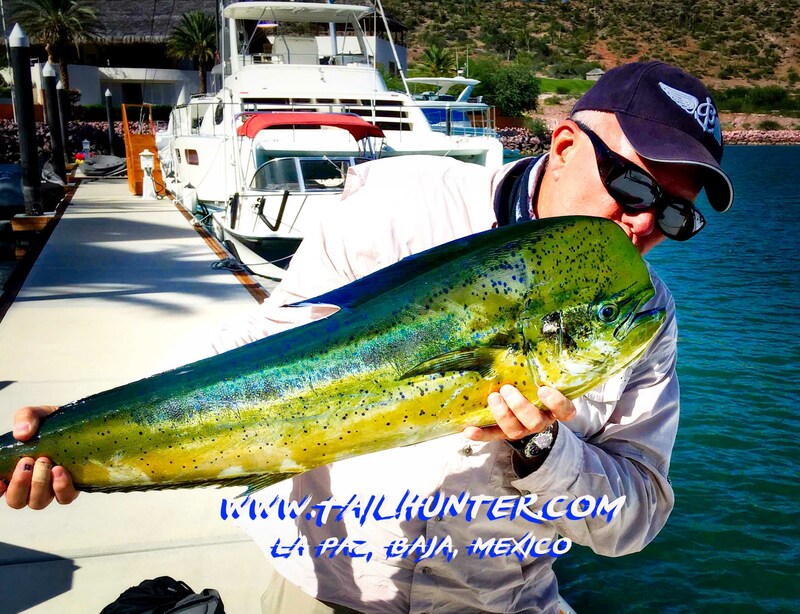 Stan Andre gives a little kiss to his dorado he got while fishing with our Tailhunter La Paz fleet. 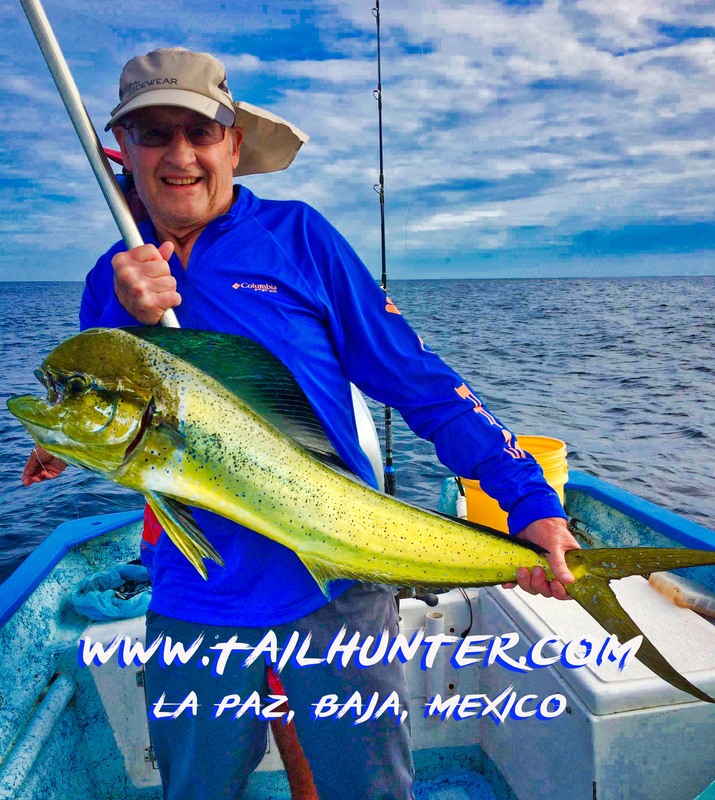 Brian’s got another dorado to add to the box! 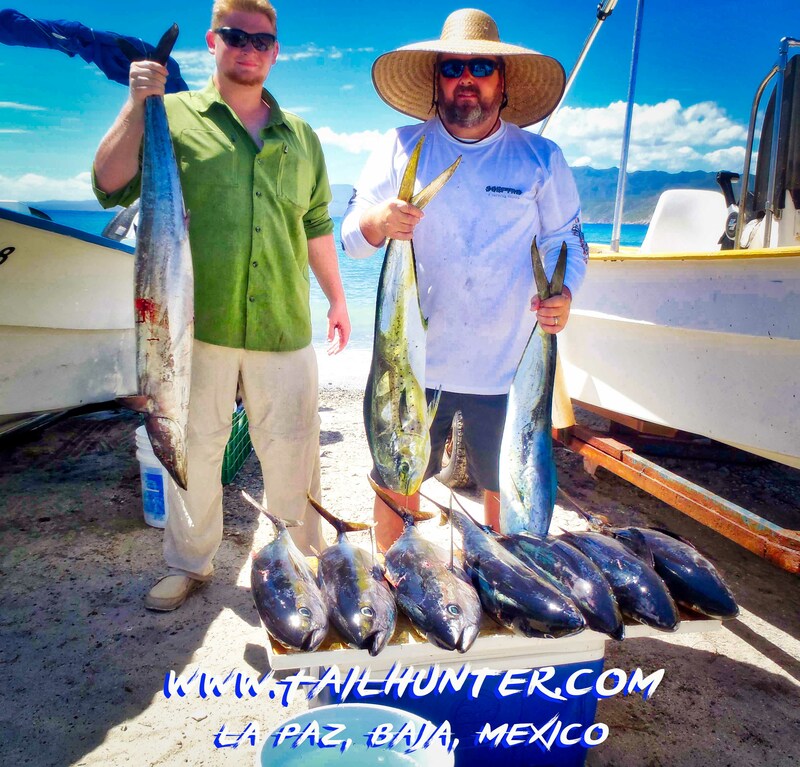 Despite some slow spots, he and his amigos took a nice load of fish home! 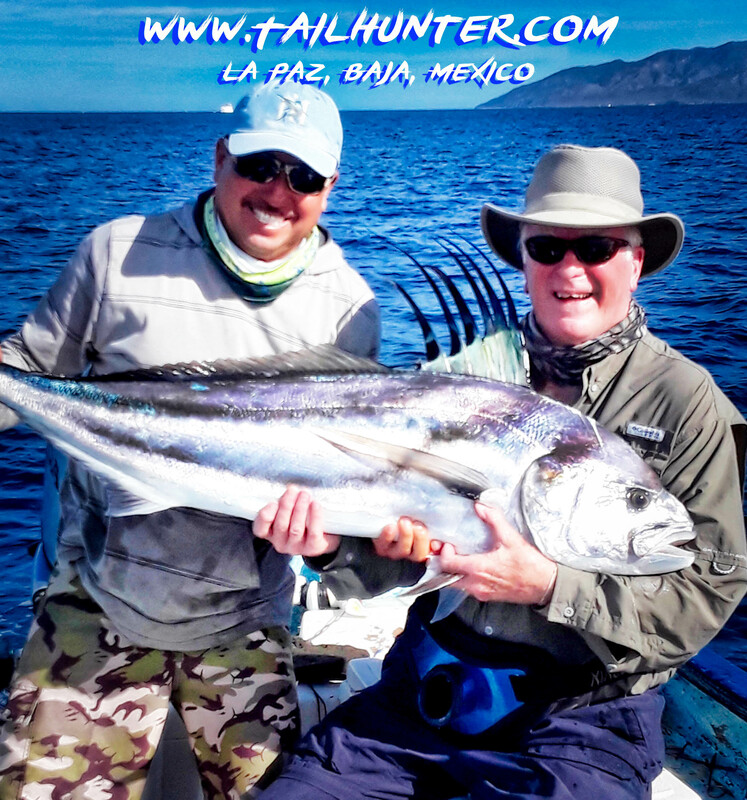 Gary Wagner loves light tackle and took this feisty rooster in the shallows in front of his place at Bahia Muertos. The fish was released. 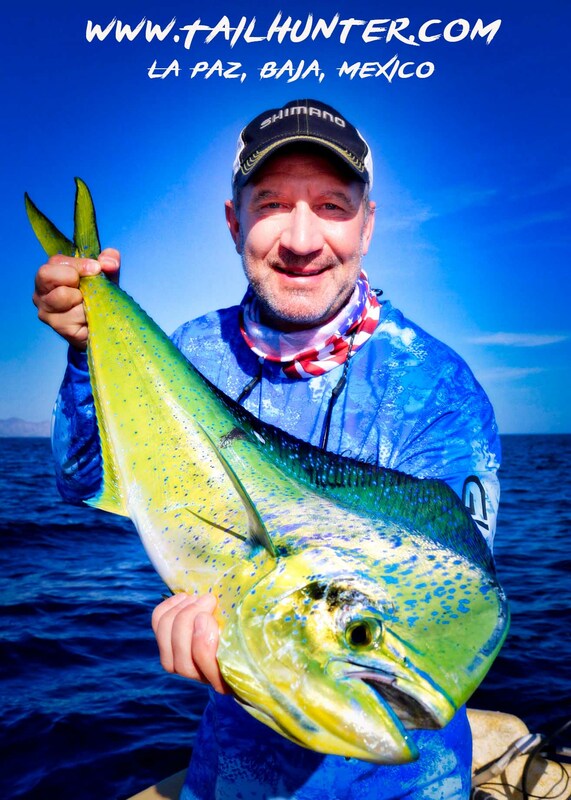 Scott Haugen knows how to pose with a fish…like this colorful dorado. 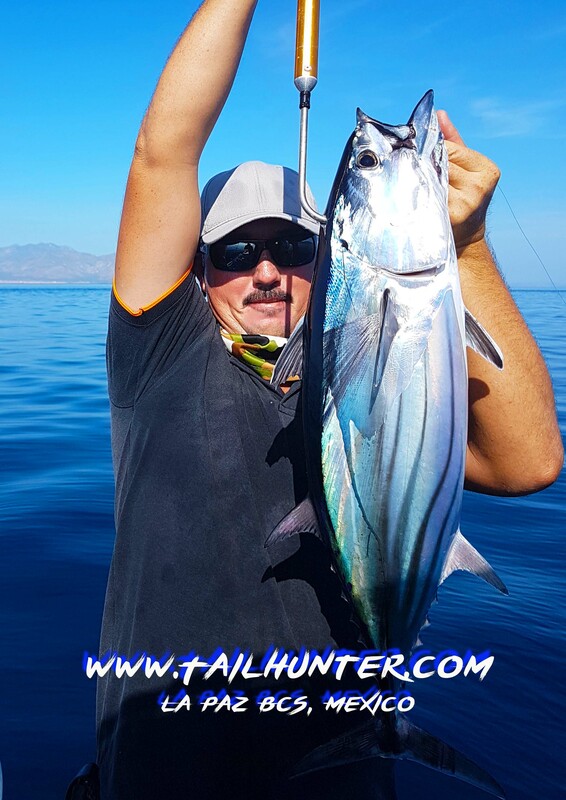 Nic had never fished before but scored a number of highly covered wahoo! 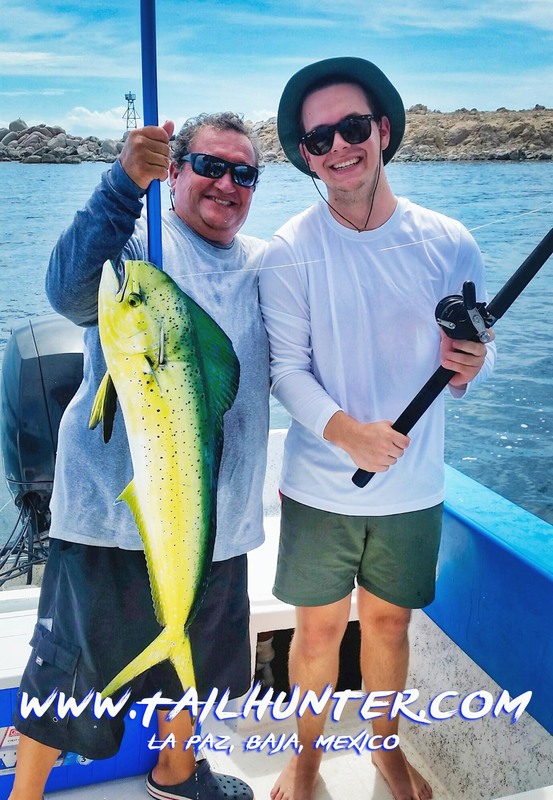 I think that’s Brian behind the mask with another dorado. Tough fish to pull out’ve the rocks, but Scott Haugen did the trick after 5 of them got the best of him and broke him off. 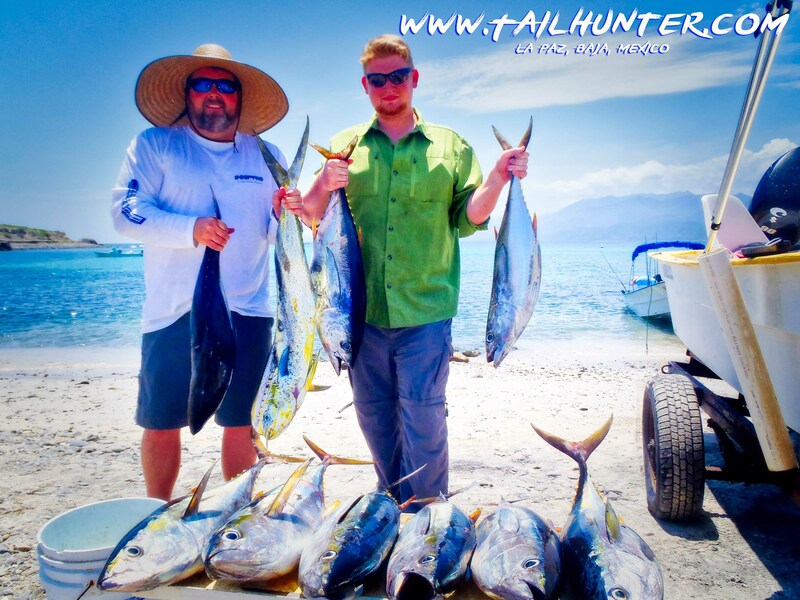 Table full ‘o’ tuna for Mike and Kirsten Hanson from Oregon! 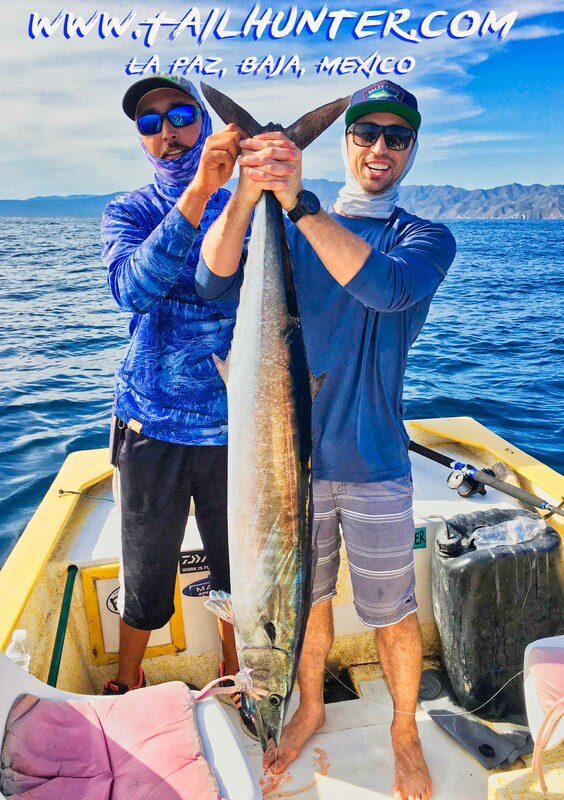 Great shot of Mike Pilkington’s first wahoo. Caught with Captain Pancho driving the rig. 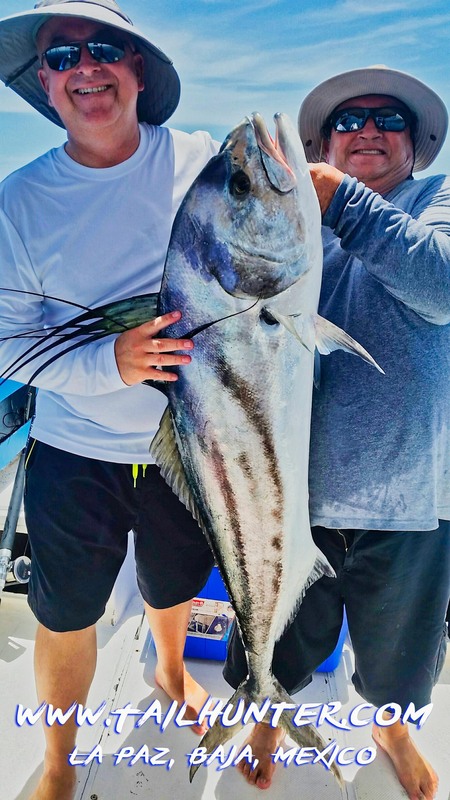 Nice fish, Mike! 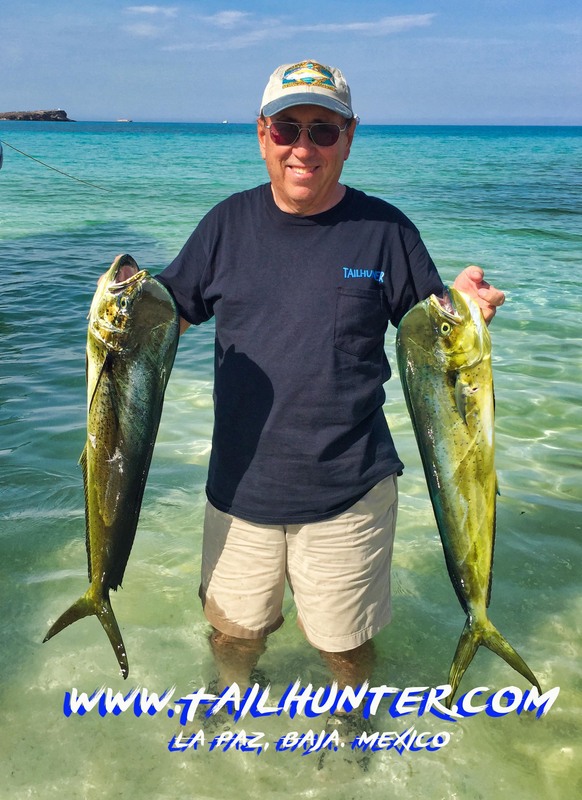 They don’t have many mahi mahi in S. Dakota which is where John Morgenstern will be taking these fillets! First dorado for Ms. Tiffany. She is such a gamer! 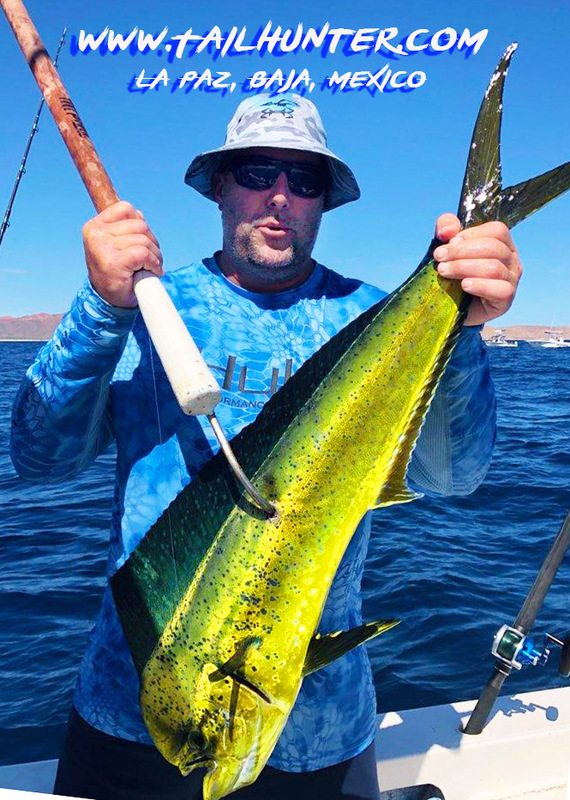 It was a hit-or-miss week of fishing as the warm water season winds down and cooler conditions move in. We often had to work a lot harder for our fish this past week than we’ve been used to during the season but everyone got fish. It just wasn’t as easy or as plentiful in some cases. It was erratic. One boat would find fish and a boat next to them would struggle. 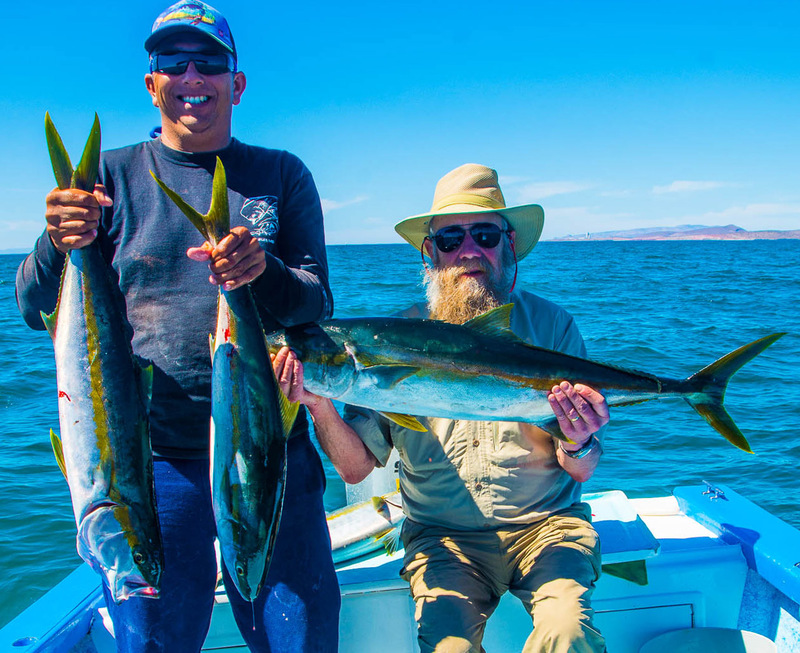 We’d look for tuna and only find dorado. 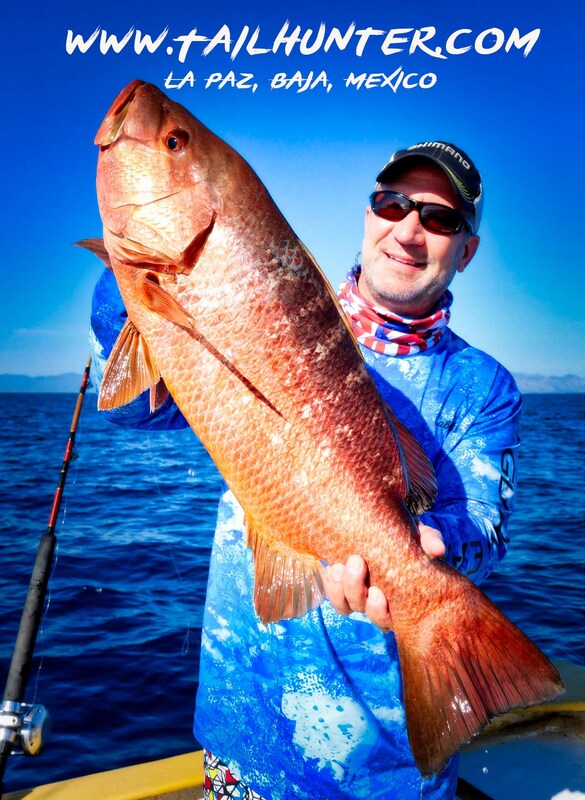 We’d chase dorado and get dog-tooth snapper. 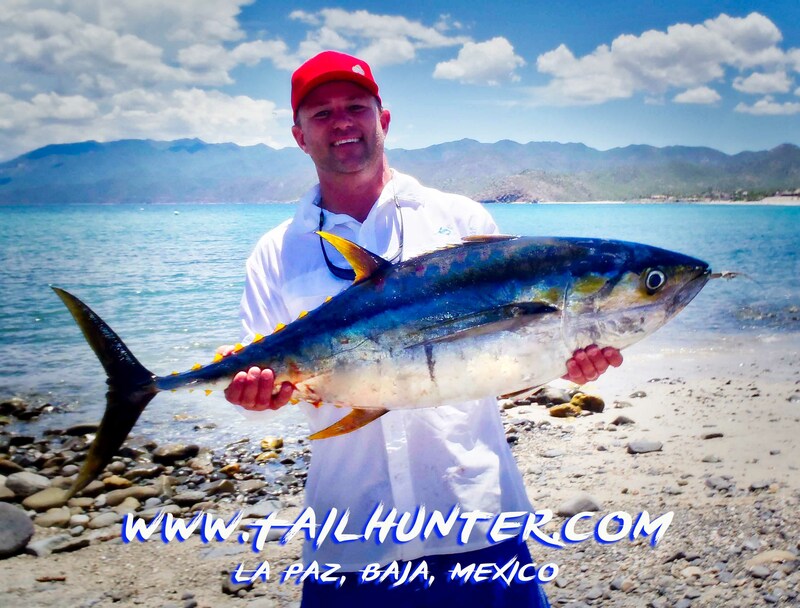 A boat trying to pargo or cabrilla would hook a wahoo! Just no rhyme or reason. 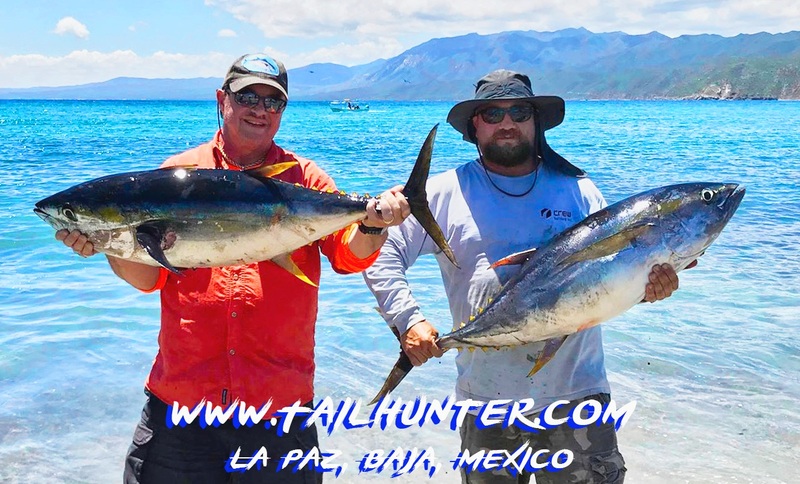 One day our Las Arenas fleet would be hot and the next day our La Paz fleet would have the hot bite! A lot of it had to do with the weather. Winds are blowing stronger and coming from all directions at different times of the day. It’s cooling off the water temps. It’s clouding up the water. It’s making bait harder and harder to find as waves crash into the shallow areas disturbing the bait schools. The big hurricane Willa that hammered far south of us, did not do us any damage. The sun burned brightly every day. 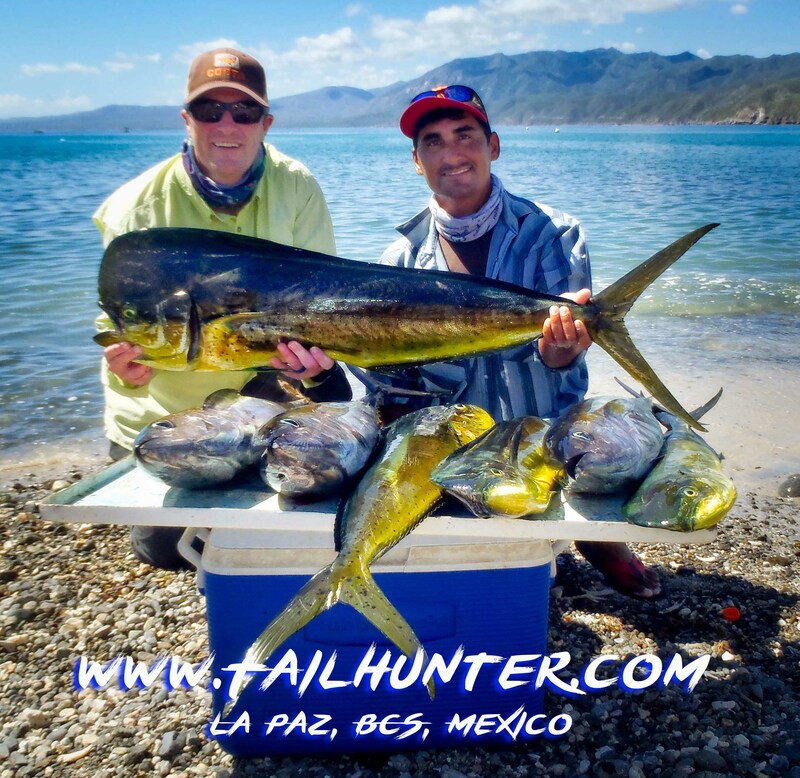 But it did throw up some big wave and southerly winds that forced us to cancel two days of fishing with our Tailhunter Las Arenas fleet. As the winds increase from the north, I imagine there will be more days that are tough to fish as the season diminishes. However, there was a good jag of wahoo this week. Some boats got multiple strikes and landed several. 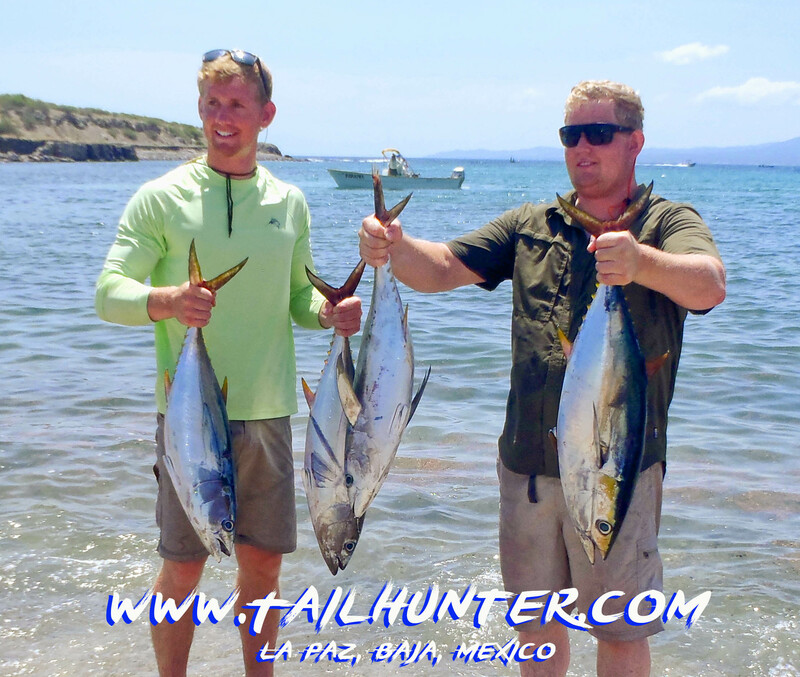 The tuna were a little more scarce, but little spots of tuna popped up if you could jump on them fast enough. The schools were very often busting water, but were hesitant to eat or would only eat quickly and move on so you only had a small window to get in on the bite. The full moon might have had something to do with that. 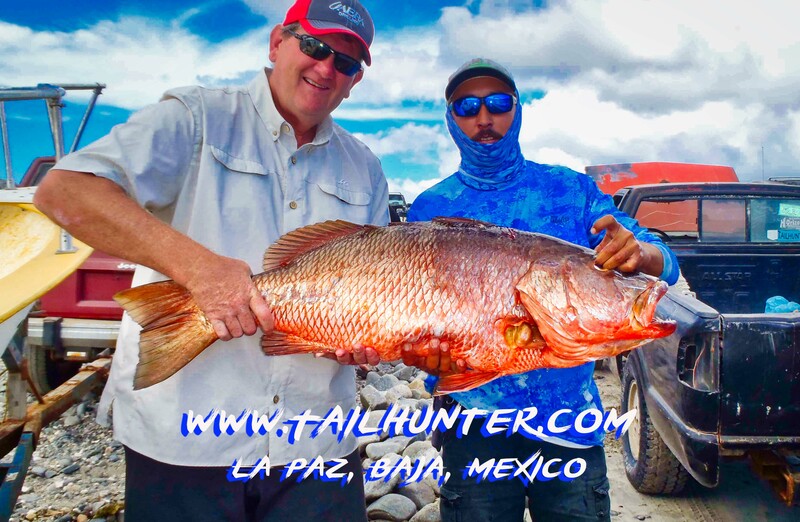 Again, we had unusually huge dog-tooth snapper and pargo liso come up off the shallows busting rods (really!) and 150-pound test. 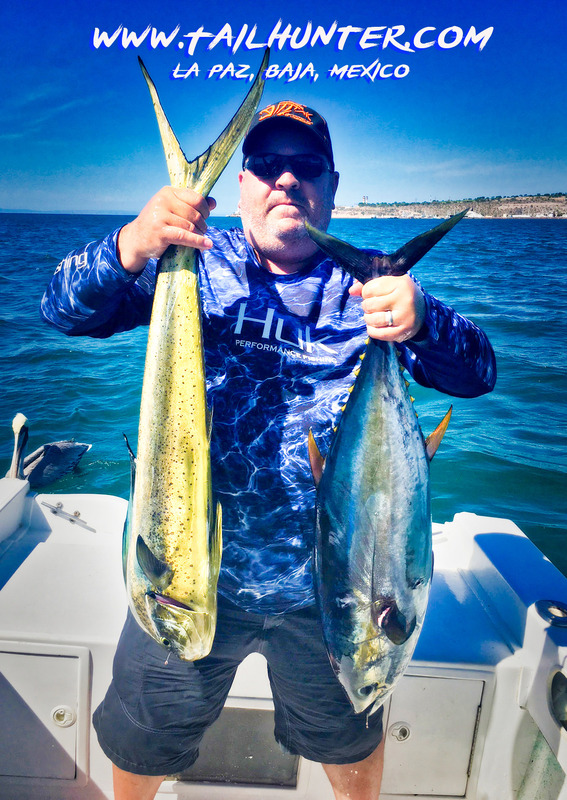 We got about 1 out’ve every 8 or 9 hook-ups on these tough fish. 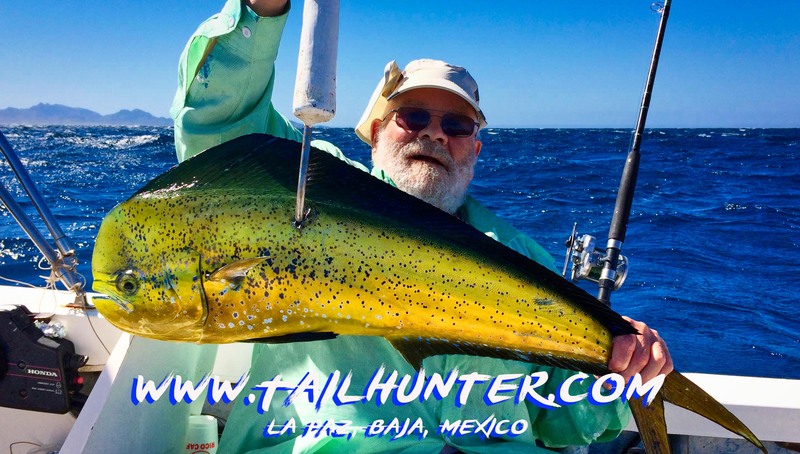 Dorado are still around. Mostly in the 10-15 pound class. This is been an emotional roller-coaster week. 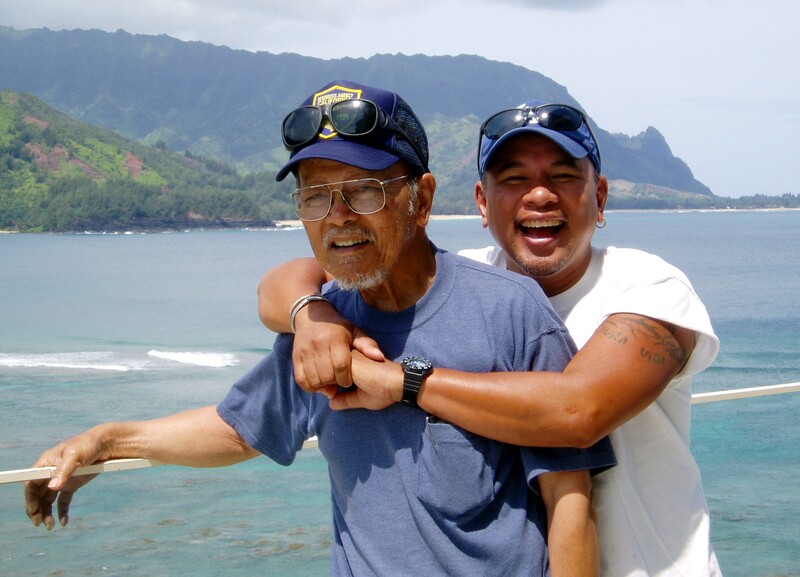 Earlier in the week, my dad passed away. He was 91-years-young. Many of you knew him. He loved to fish. He loved reading this fishing report. Thankfully to Jill, she jammed a ticket back to Los Angeles in my hand on a “gut feeling” and told me to get back to see him NOW and she kicked me outta La Paz. I got to spend a few hours with him and hold him for a bit and after spending most of the night with him told him I’d be back in the morning to have breakfast with him. Little did I know that would be the last. The next morning, he took a breath and let go and slipped quietly and peacefully away. 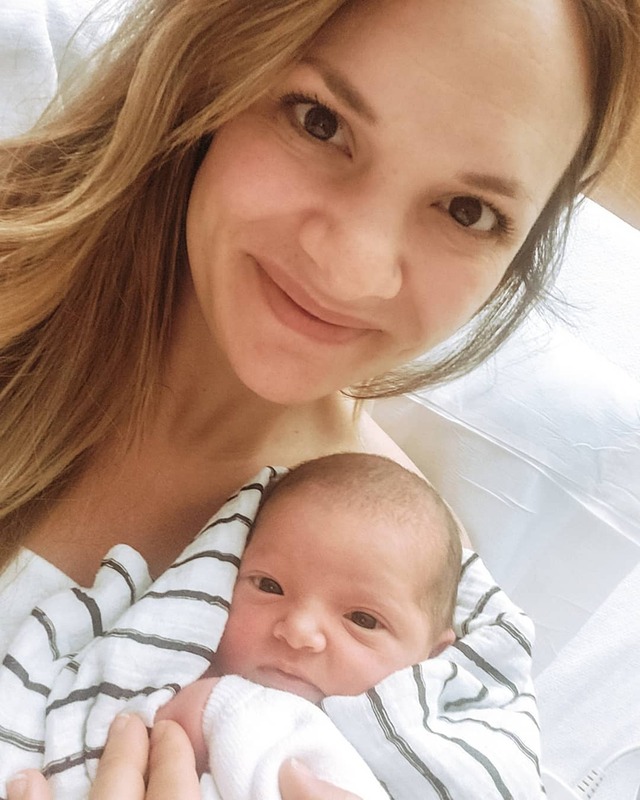 I had to get back to La Paz and three days later…talk about the circle of life, we welcomed Hannah James Reid our 2nd grandchild to our daughter Jessie Reid and Brian Reid. Whoo-hoooo!!! The circle of life keeps rolling! Just wanted to reach out to thank the hundreds of you that sent condolences to both Jill and I and also all of you sending congratulations. We do not pass through life alone. Glad to be on the path with so many of you. God bless! Weather – We had Hurricane John that bounced in and bounced out. Some flooding, but honestly nothing serious as it headed out towards the Pacific, but enough that we had a few days of winds, rain and waves. Enough to cause a nuisance and shut down fishing for 2 days. But, even after it technically went it’s way the days in the aftermath still were cloudy…some rain…some thunder and lightning and winds. Very unpredictable and erratic. Water – Did not take as bad a hit as after other storms where the water is very turned over and dirty. Since there wasn’t torrential rain, there wasn’t enough run-off to dirty the water. Waters relatively blue and clear at 83 degrees. 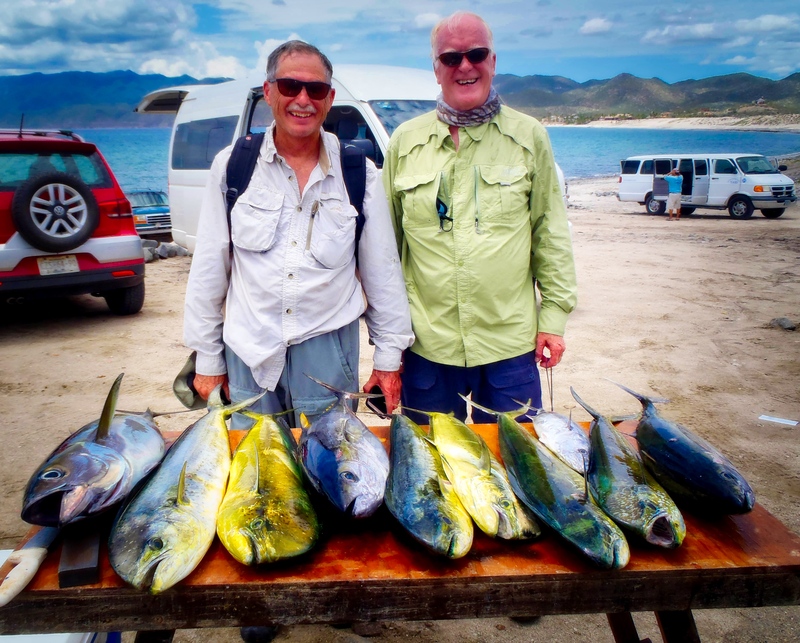 Fishing – Week started pretty well with big tuna, and dorado. 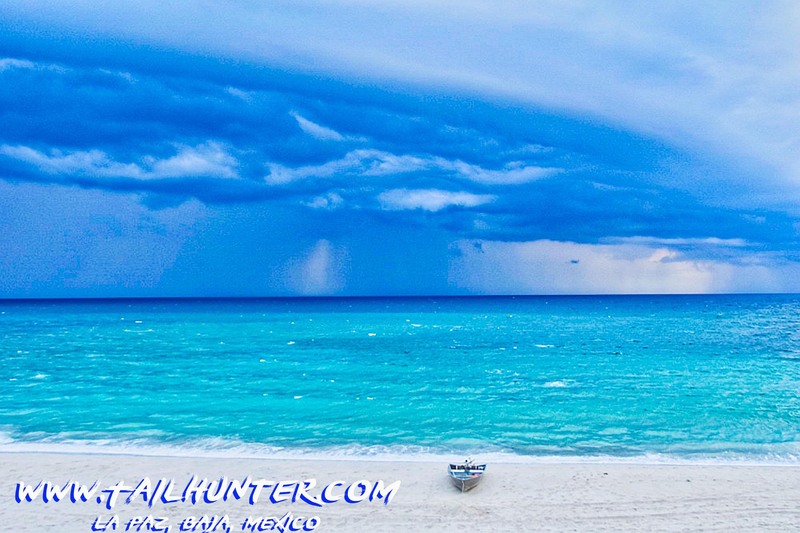 Then the storm hit and you always wonder what it will do to the fishing. How long will the fish take to recover. Surprisingly, the fish were fair good to us. Not great, but not as bad as other times. We still had action although we had to work harder for them, but everyone caught fish. Surprised to see cooler water fish like pargo and pompano showing up. Are waters getting colder already? 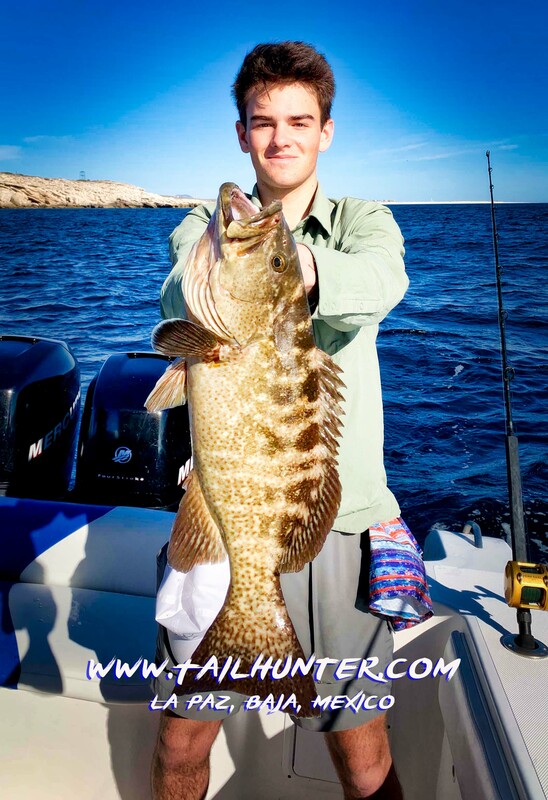 We usually don’t see these fish except in late winter and spring! 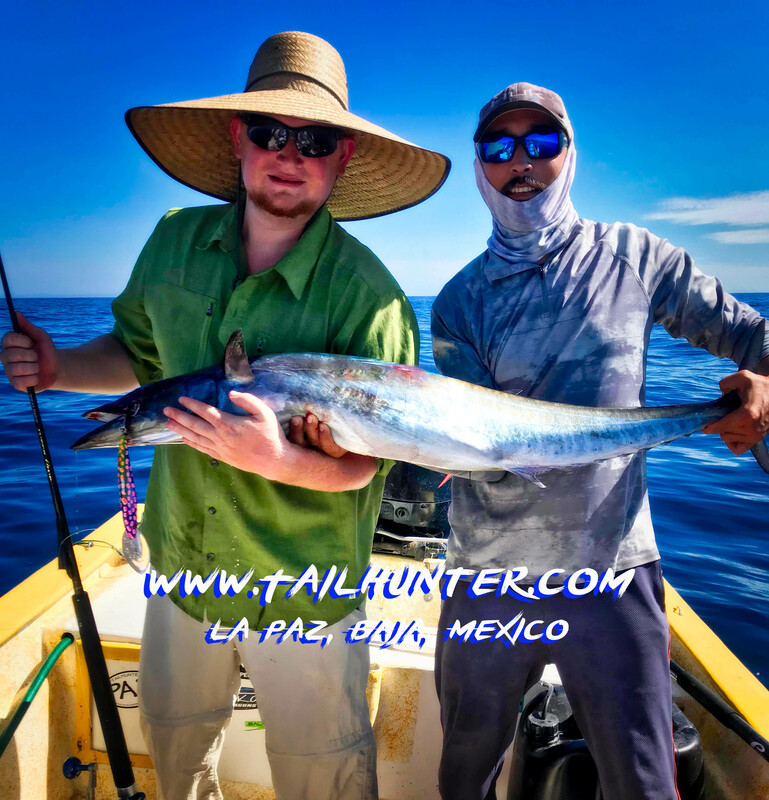 Catching – Still losing the majority of those big tuna; a couple of wahoo bites; and more dorado than we should! But that’s fishing! Everyone took home meat that wanted meat. 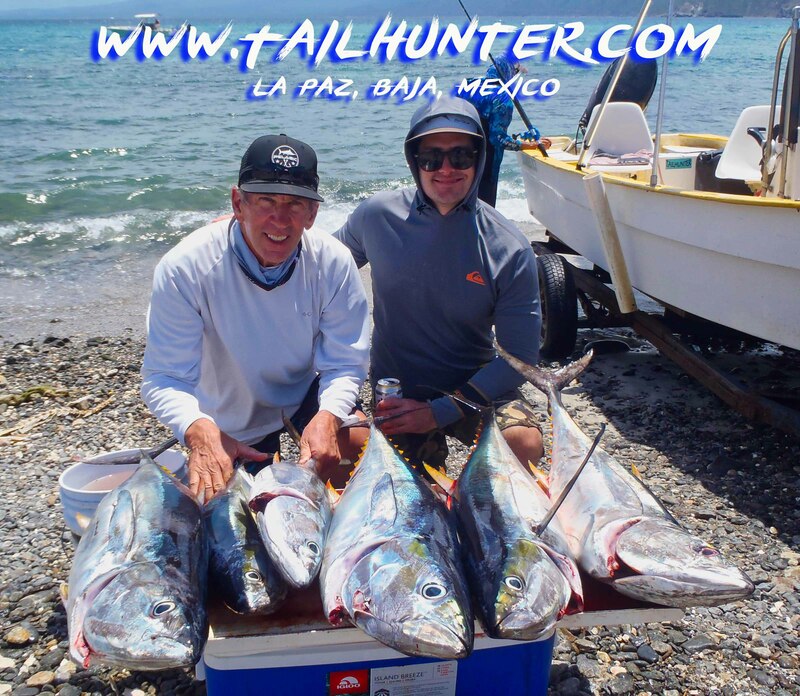 Big tuna for Laura Hernandez and Mark Buchanan from San Diego who battled the big fish just off Punta Arenas. 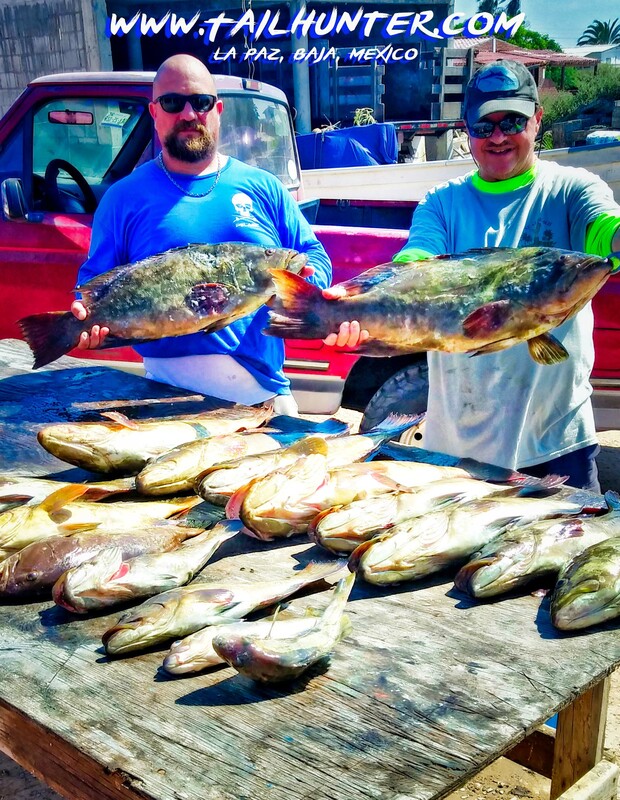 The fish were measured at about 50-55 pounds each. A good reason NOT to be out fishing! Waterspout off Cerralvo Island during the storm! (Taken from the beach!) . Thanks for the shot, Rusty Cain! Little vide of the beginning of Hurricane John. Even after the hurricane “left” we still had localized and intermittent shower and thunderstorms all week. Pretty shot! Thanks, Mark Buchanan! 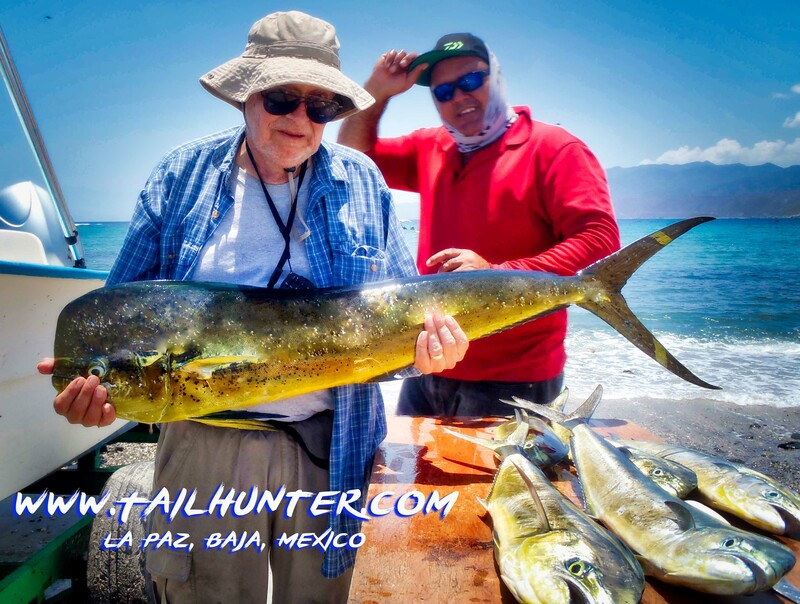 The fishing rabbi from Portland Oregon, our amigo, Sheldon Donnell used to have a temple in Orange Co, but retired to Portland and often came to fish in La Paz with Tailhunter Sportfishing. He got this nice bull just off the rocks near Punta Arenas. One of our favorite all-time families! 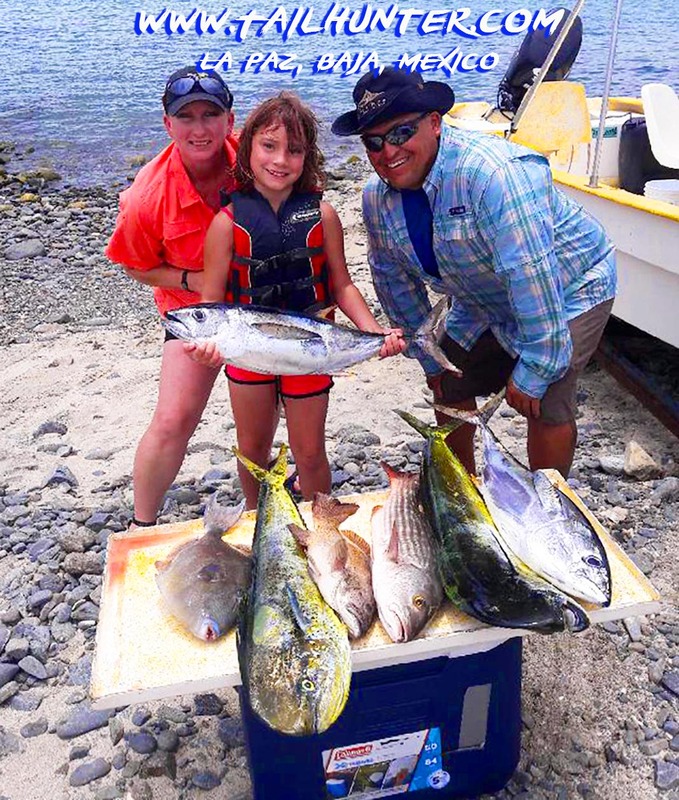 Diego and Kelly Sanchez from Loveland, Colorado brought granddaughter, Selena down who had a great time fishing. 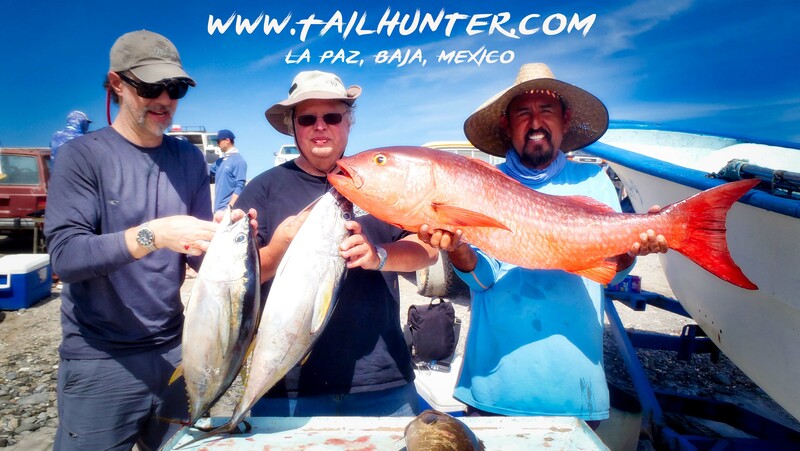 Here’s one day’s fun of tuna, dorado, triggerfish and pargo! 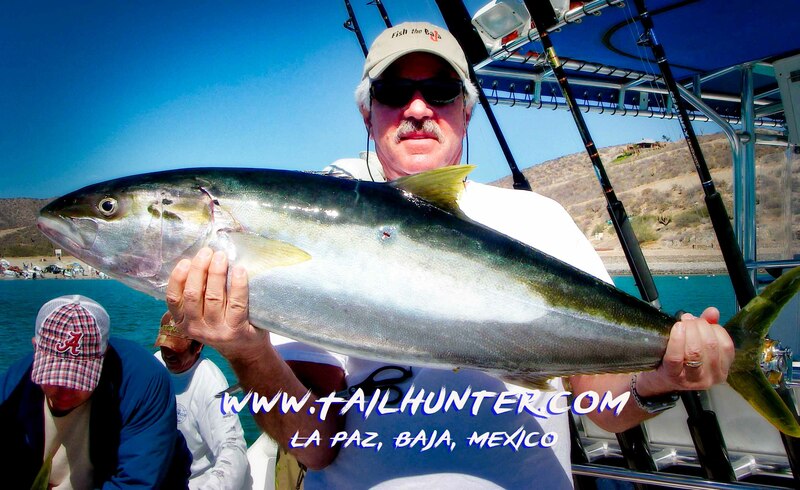 Plus they released jack crevalle and bonito. 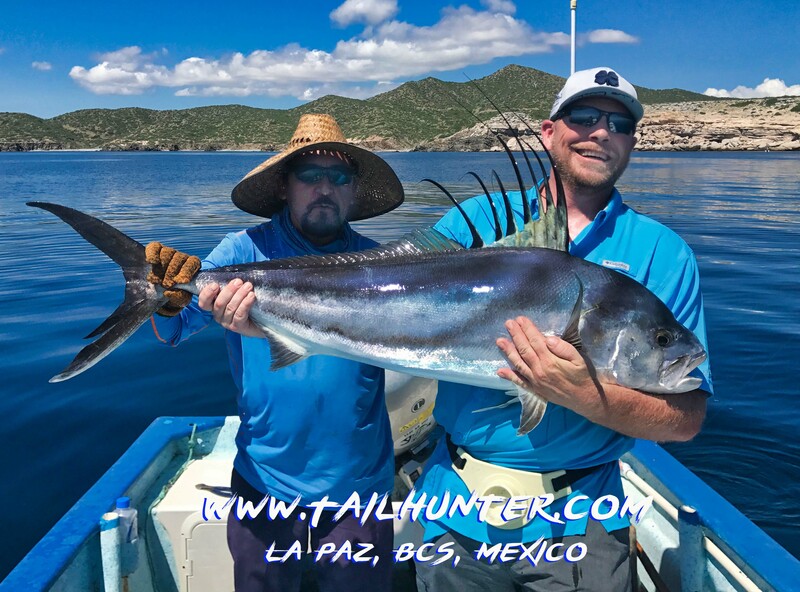 Bryan Forward from Carlsbad wasn’t fishing for roosterfish just north of La Paz, but while fishing in a dorado school with Captain Rogelio from the Tailhunter Fleet, this big boy popped up and chewed his bait and the battle was on. The fish was released. I think one day, Al Sandstrom will probably move down here. He just has too good a time fishing! 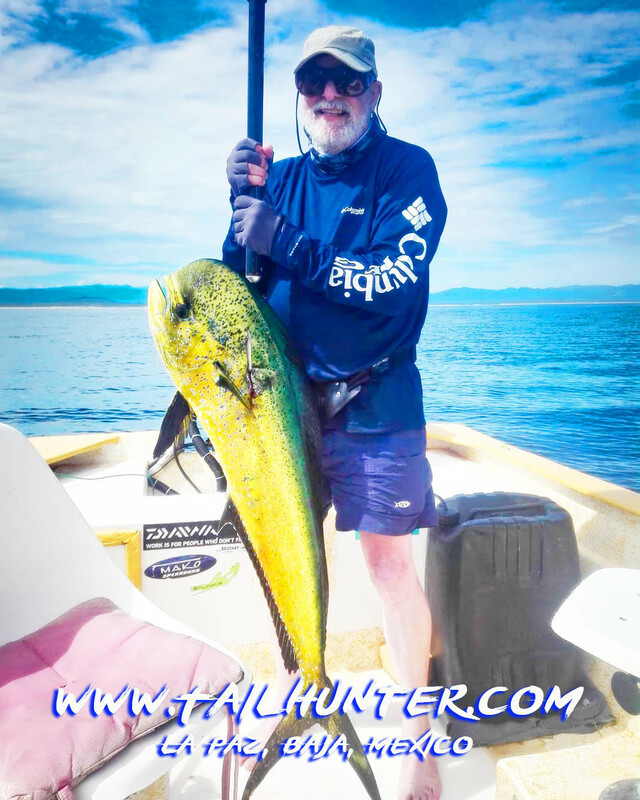 Dorado in hand caught with our Tailhunter La Paz Fleet. Skies are still cloudy but the smiles are real! 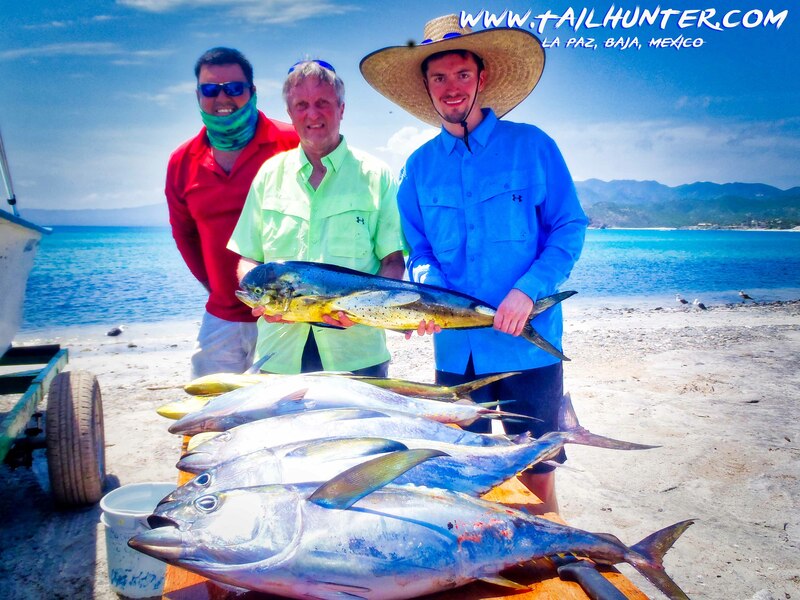 Captain Jorge with Mark Hawkins and Harry Hsu posed with 3 of their 5 yellowfin on the beach at Muertos. 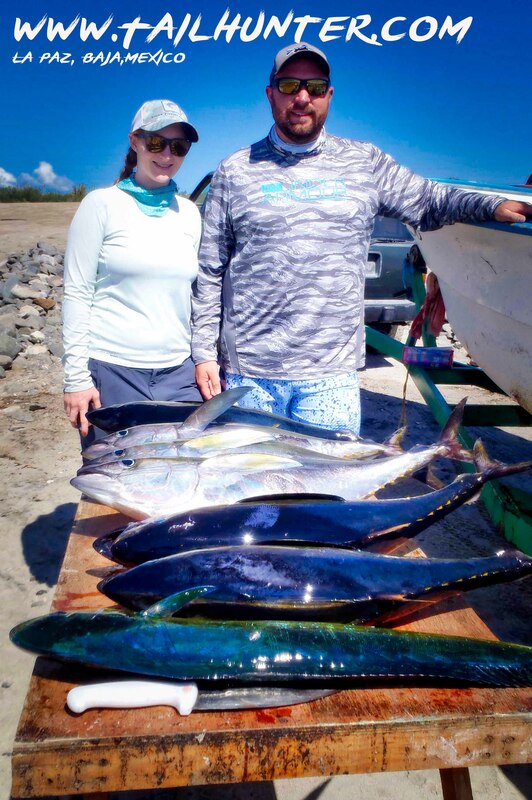 That’s alot of mahi mahi for Mark Buchanan and wife, Laura Hernandez from San Diego. Always in the fish! He’s a little tired! 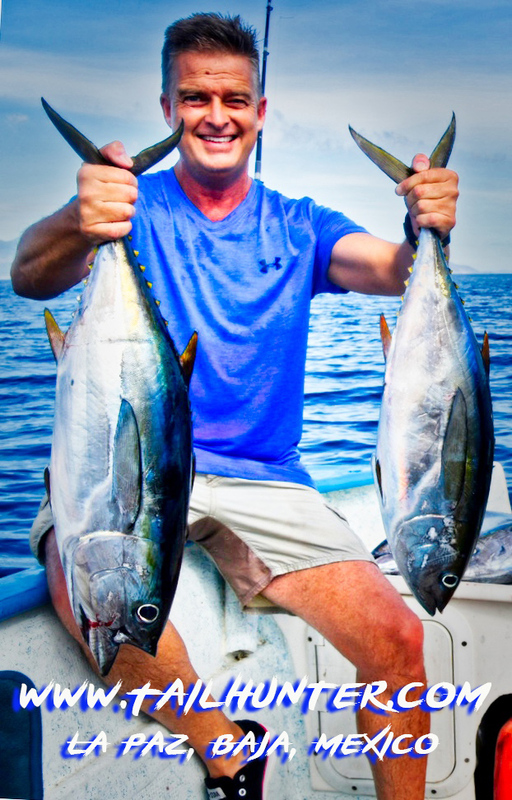 Tony Smith has 4 big tuna on the table. First time down here and he had a good time. The best is when someone catches their first fish ever! 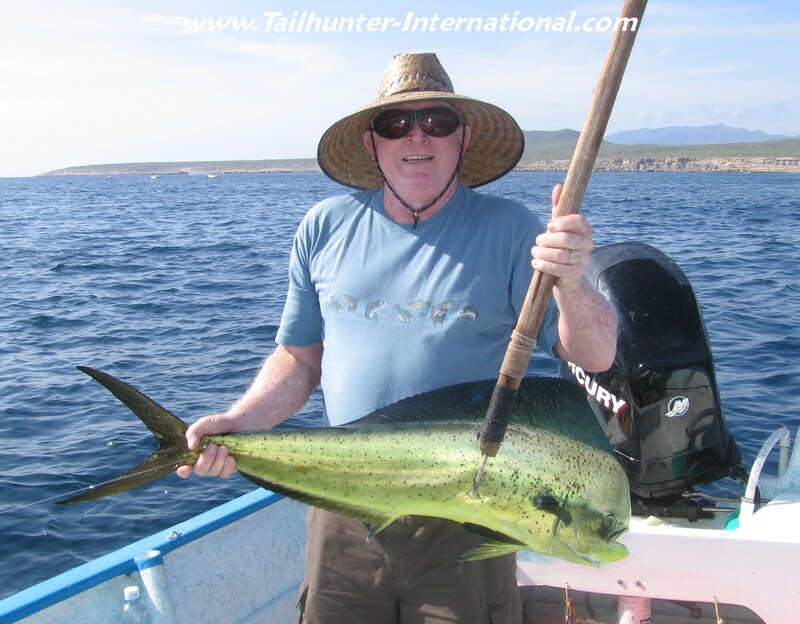 Rob Forward of Carlsbad and Captain Rogelio with his first dorado! So crazy unusual to be catching pargo liso because normally, they are cooler water fish we catch from Feb. to April! 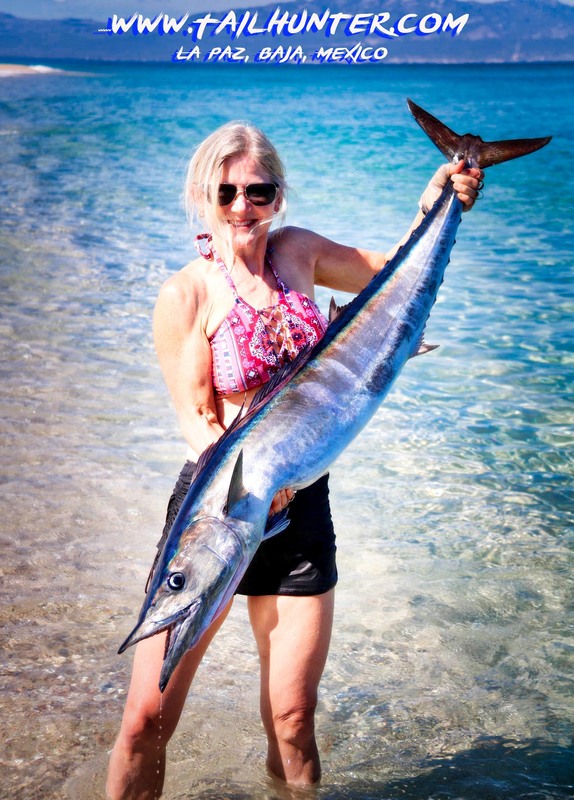 But, Shelly Donnell got this one off the rocks at Punta Perrico. Great eating! Tough fighter too! 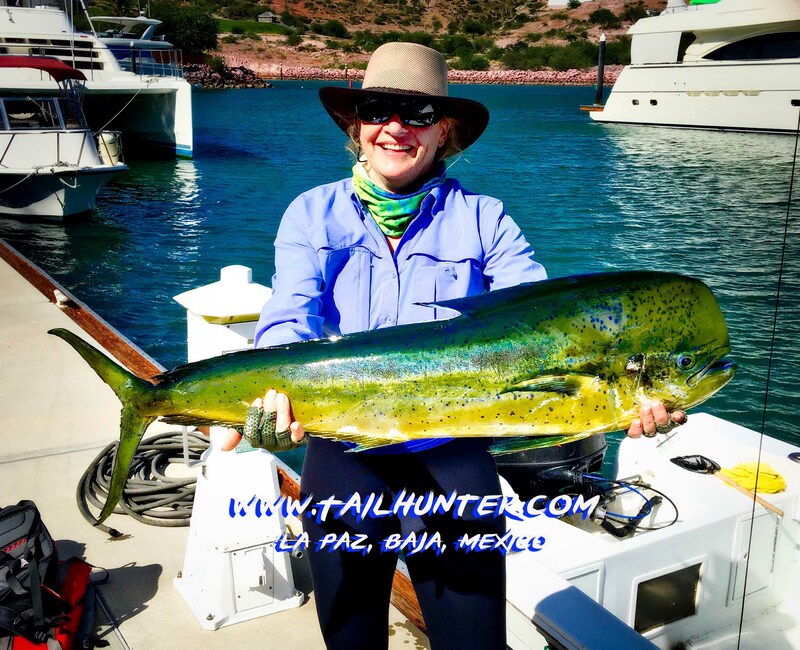 Hope came to visit us from Idaho for the first time and got her first dorado showing here on the beach at Balandra! Great to have her down! Colorado friends since college, these two have been Tailhunter amigos for many years. 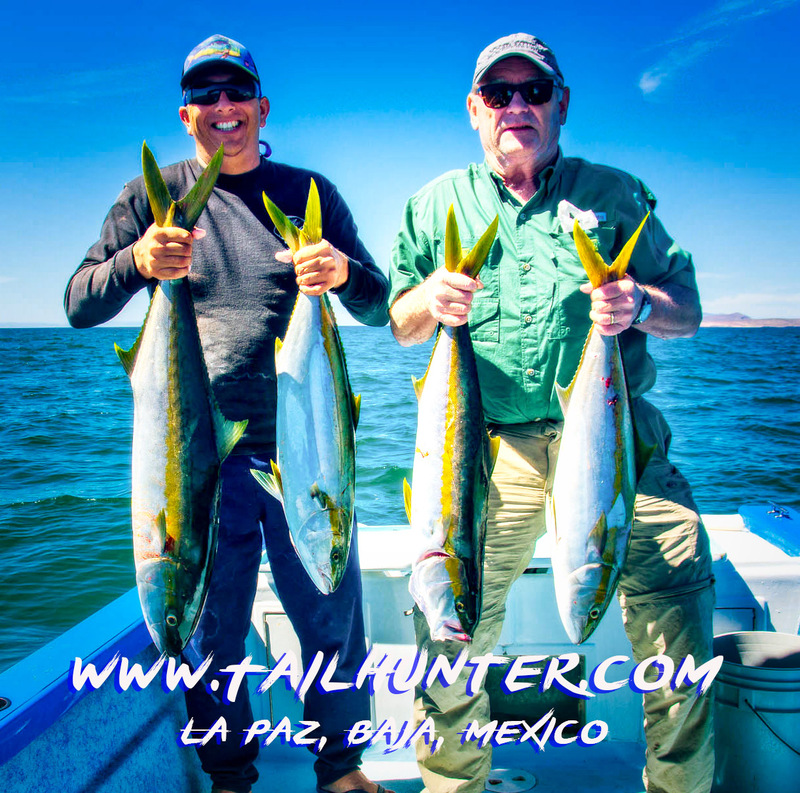 Always smiling, Frank Kunze and Lee Carlson with a pretty good day out’ve Muertos Bay of tuna and dorado. This one weighed out at over 52 pounds for Laura Hernandez. These are beast fish! Check out how close she is to the beach at Punta Arenas! 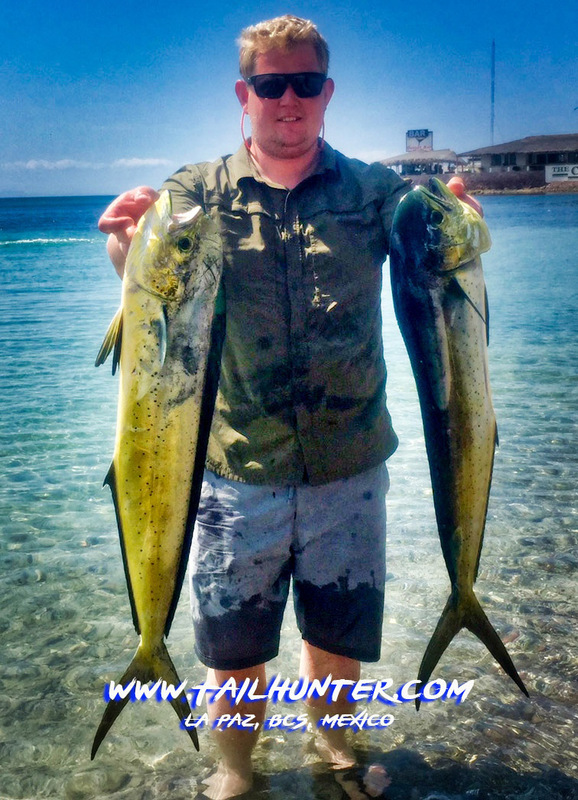 Football-sized yellowfin tuna showed up later in the week that were alot of fun and surely easier than the 60 pounders earlier in the week. San Diego boys in the house! 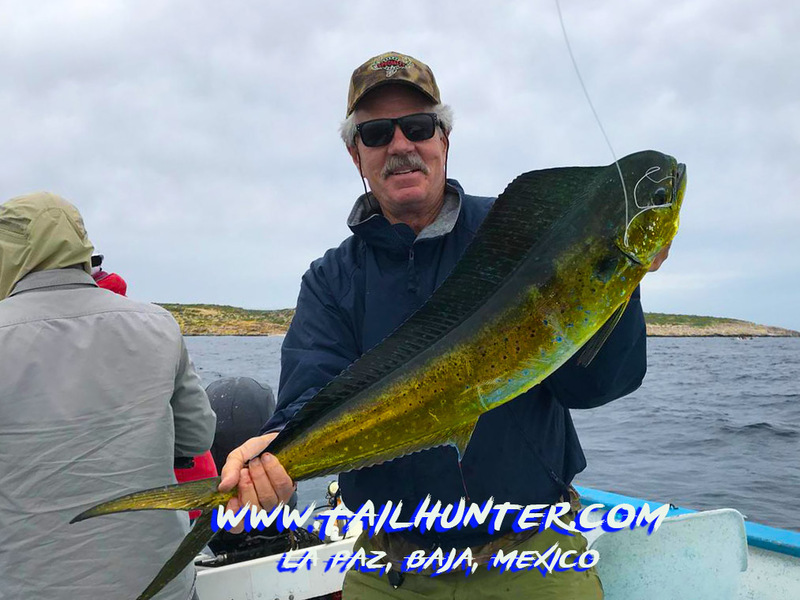 Captain Gerardo photo-bombs a dorado photo of Cal Lambert from Colorado trying to pose with one of several nice dorado caught just before the storm hit! 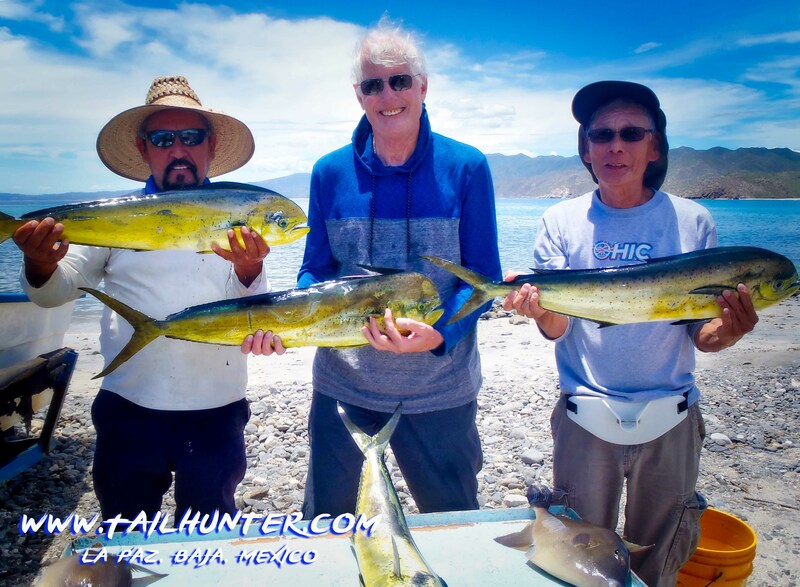 Harry Hsu and John Land with Captain Jorge and a nice haul of dorado and triggerfish. 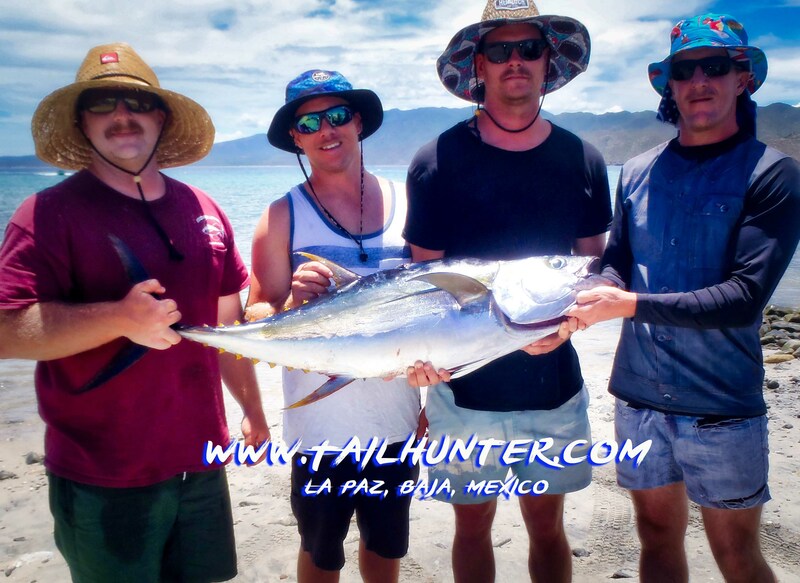 Alex Moser from San Diego and his amigos with a big 50 pounder that took over an hour to land! 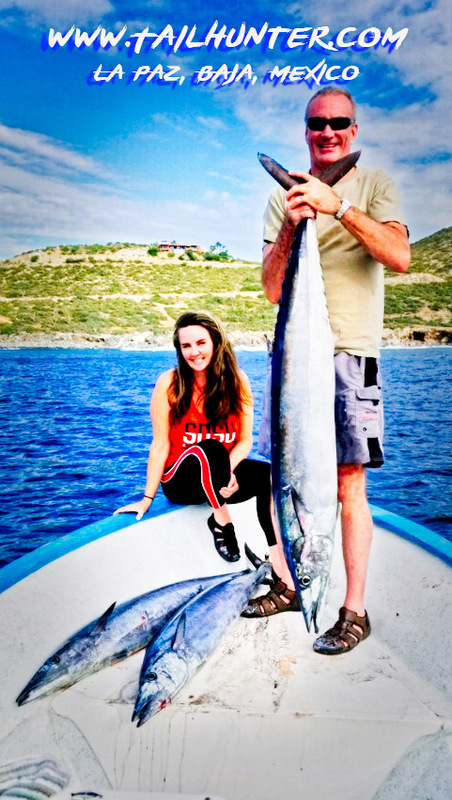 Laura has a knack for getting big fish! 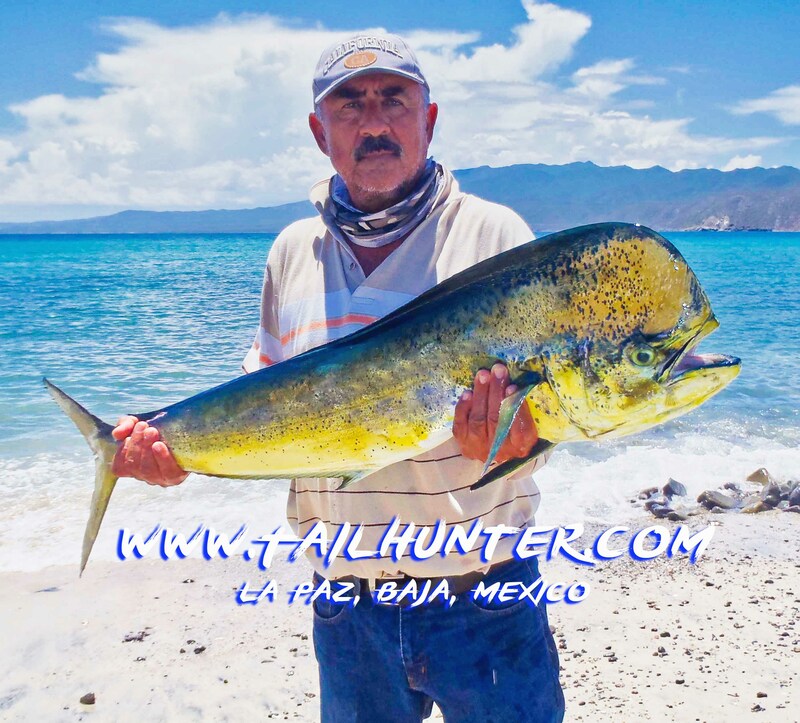 Nice bull dorado off Las Arenas Point! We had a strange and crazy week. Things were going pretty nicely and then out’ve nowhere, what looked like a week of intermittent showers and occasional rain suddenly got a name and turned into “Hurricane John!” It got us scrambling! These things are un-predictable and although it was only a “Category One” storm, we’ve seen them do some erratic things over the years and while the storm path didn’t have John barreling directly into us, it was going to glance off the southern tip of Baja and bounce out pretty hard. The storm warnings went out and the clouds, wind and rain came in. 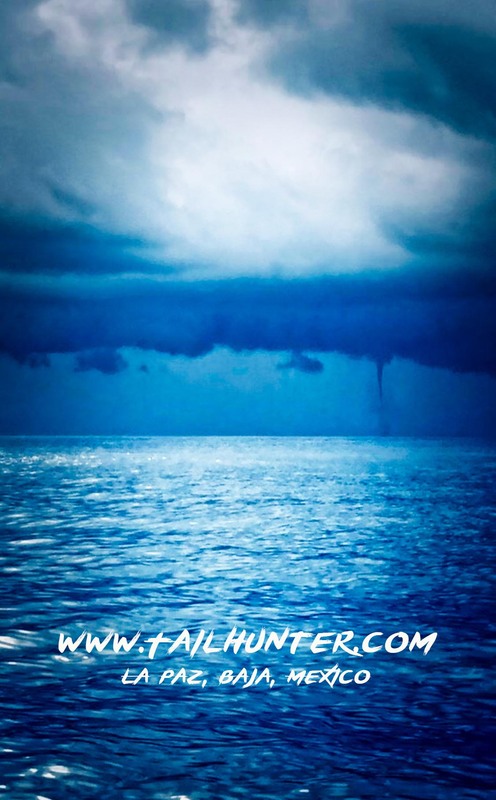 Thunder, lightning and even water spouts! Some flights got diverted and although we never got the heavy hit, it was enough to have the Port Captain shut down the port and ban all boat traffic. Big waves and strong winds didn’t help. Of course, that meant cancelations; no fishing; and lots of schedule juggling. It’s too bad because fishing had been pretty good. Then the storm left. Sort of. The port opened, but for several days, we didn’t know if the port captain would change his mind and shut things down again. So there were days when we had everyone ready, but also telling them they might have to head back to their rooms if the port captain shut things down again. 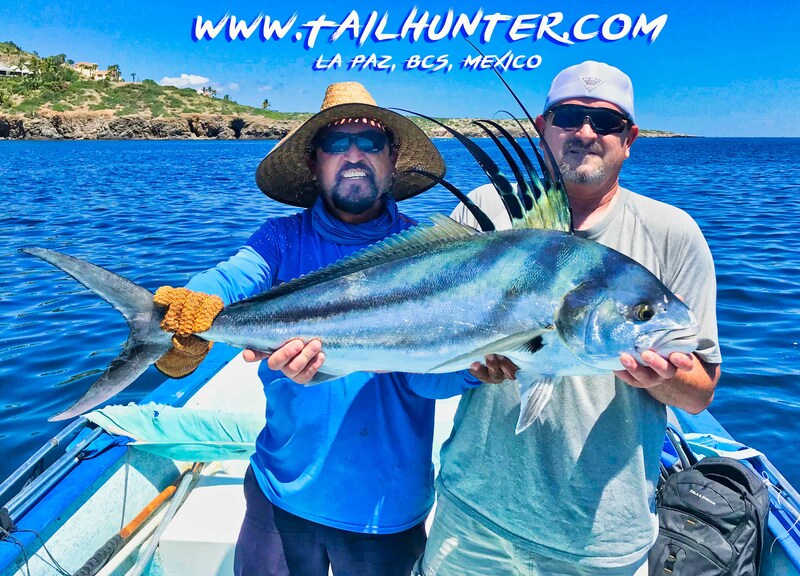 Because while “John” moved off, it never really completely left and almost each day, we had threats of wind, rain and big seas and occasional thundershowers and left everyone wondering what the next day would be like and days when we went fishing and still got wet. Fortunately, the waters didn’t take too hard a hit from the storm and fishing the rest of the week was a lot better than I thought it would be although it still was not quite as good as it had been. 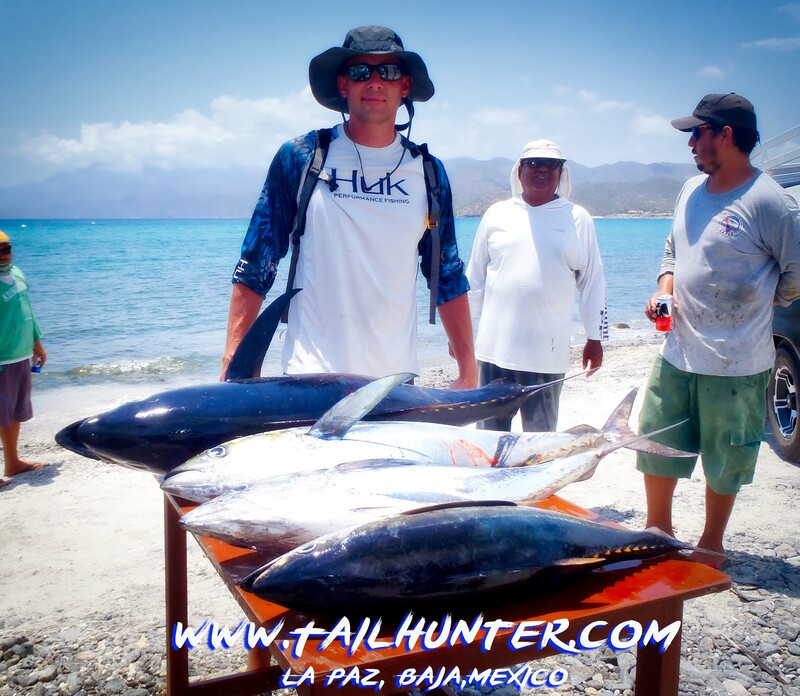 At Las Arenas/ Muertos Bay for our Tailhunter Las Arenas Fleet, the big tuna were still around although a bit pickier. 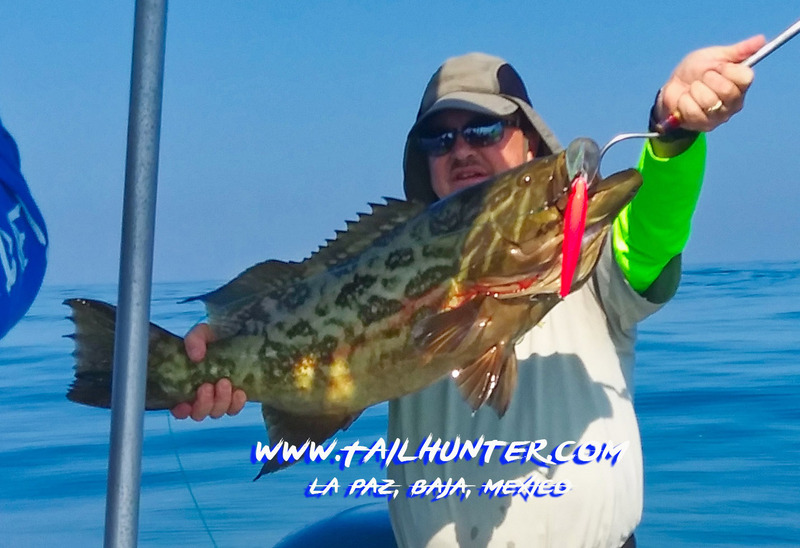 However, smaller fun football sized 10-20 pounders showed up right off Punta Arenas not far from the lighthouse. 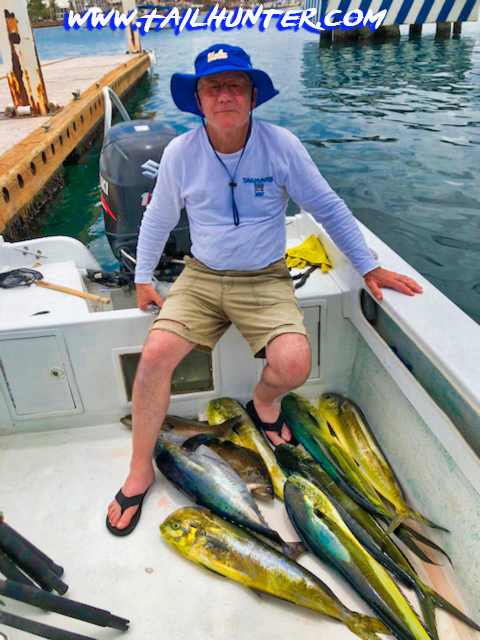 Also, decent dorado up to about 25 pounds rounded things out and surprisingly we got pompano and nice big pargo liso snapper that usually we only catch in the springtime. It makes me wonder if cooler waters are already moving in! 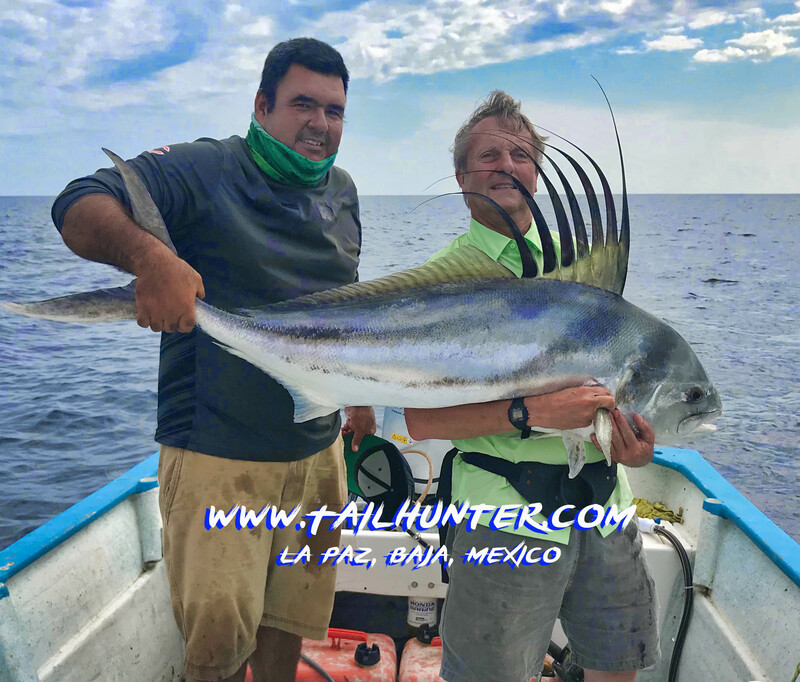 Several roosterfish also hooked and released in the 30-50 pound category. 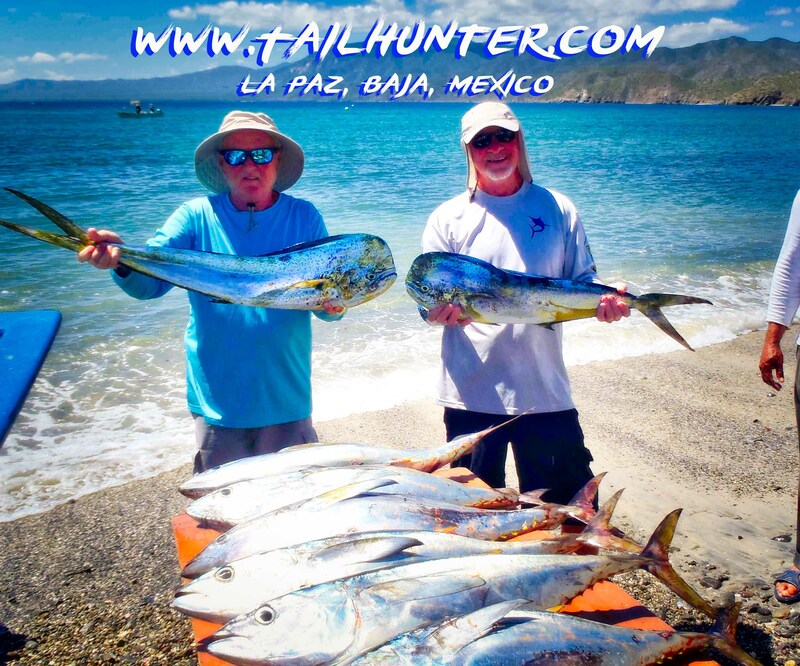 For our Tailhunter La Paz Fleet, dorado were centerstage again. 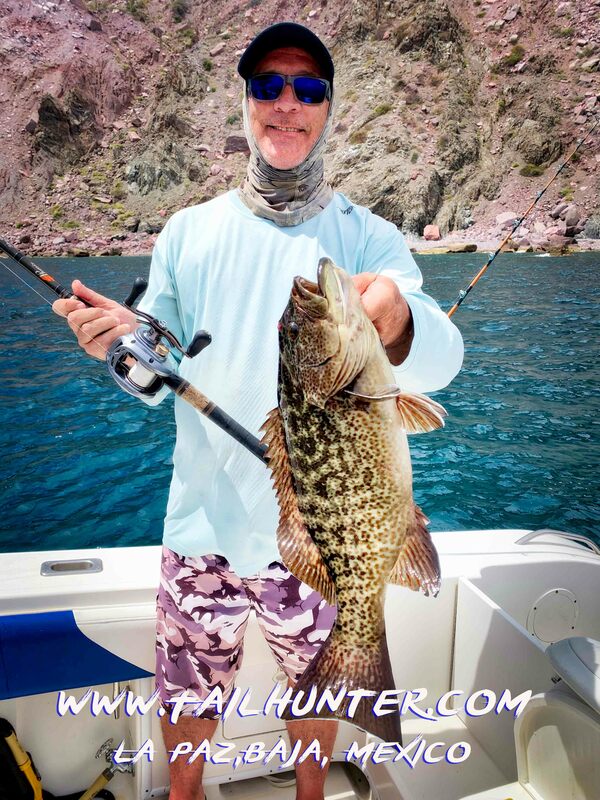 Most of the fish were 5 to 20 pounders, but if you find the right spot, it could be crazy frenzied fishing. Most days, the boats got limits or near limits although some days the bite didn’t take off until late in the day. If boats left too early they sometimes missed the bite. So, overall, not too bad given the weather. It could have been a lot worse! 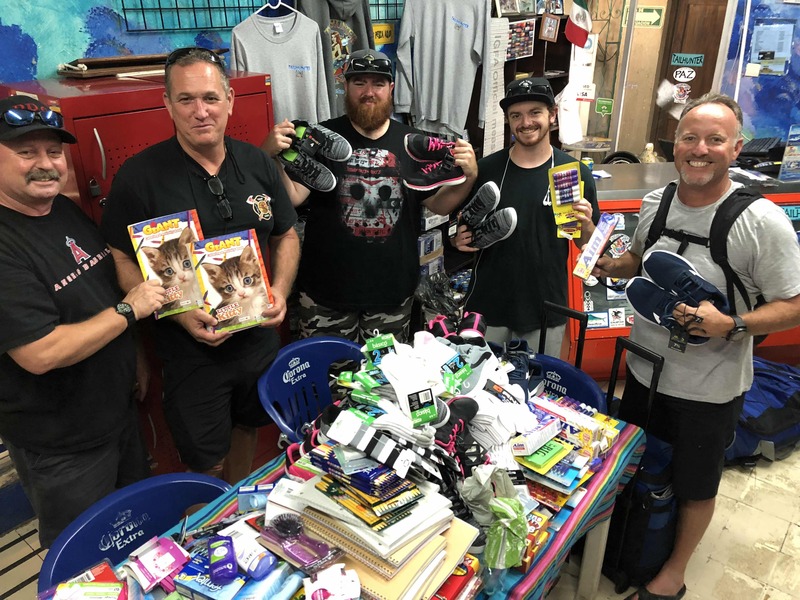 I’m sorry I don’t have ALL the photos of everyone who brought donations or school supplies, clothes, shoes, hygiene and other needed items for our Tailhunter Outreach Program. But, e are so grateful for the generosity. This year alone, we’ve collected over 1000 pounds of much-needed items that we distribute to the community. 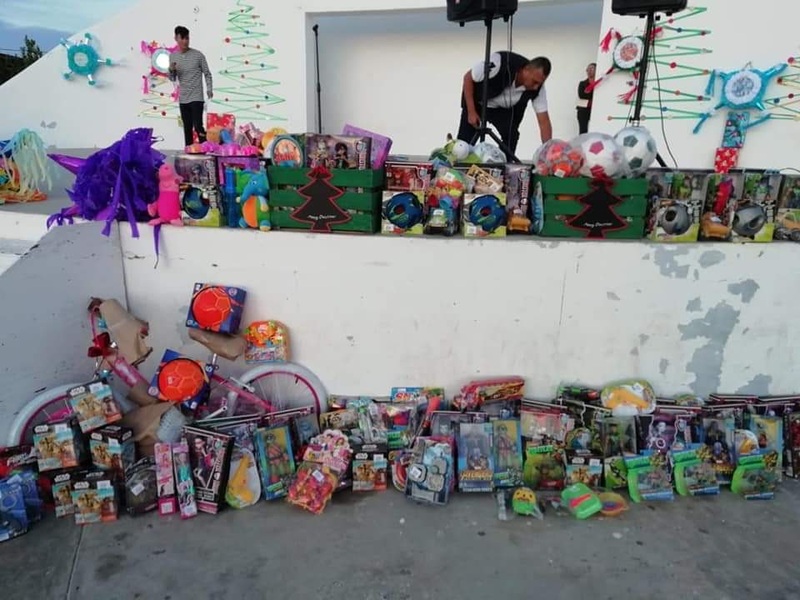 Some of the photos above are just from the last week and all of this went to the school and orphanage in Los Planes near Las Arenas. 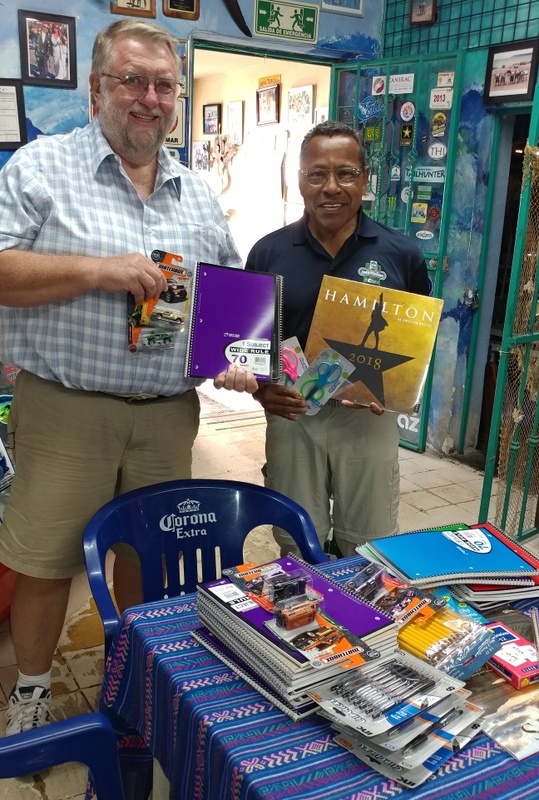 With school starting this week, the supplies and clothes were much appreciated! 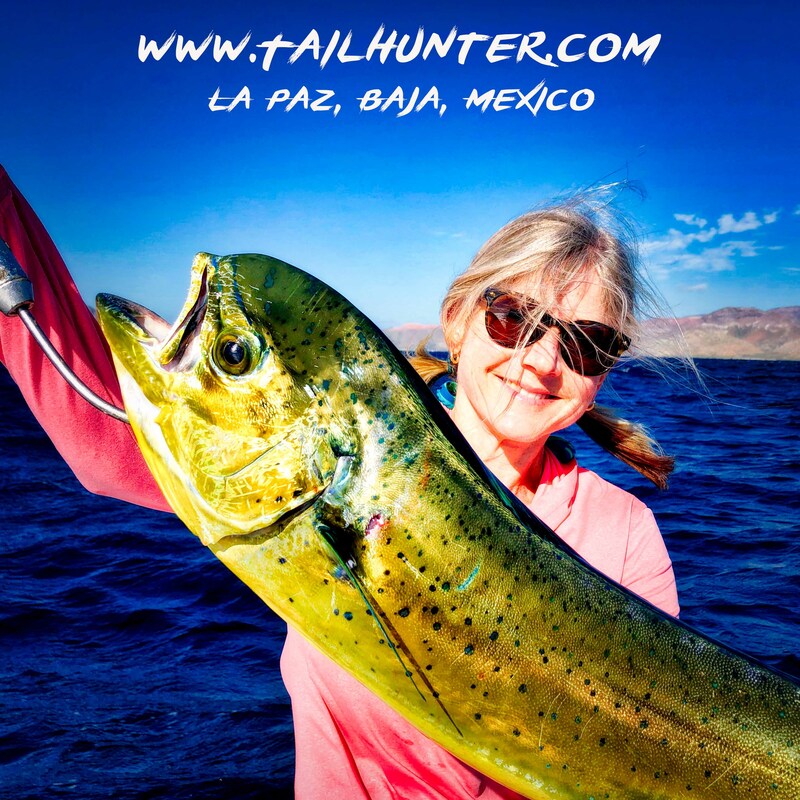 Tailhunter Tribe rocks! Thank you all!